was involved in a July 2017 MVC. 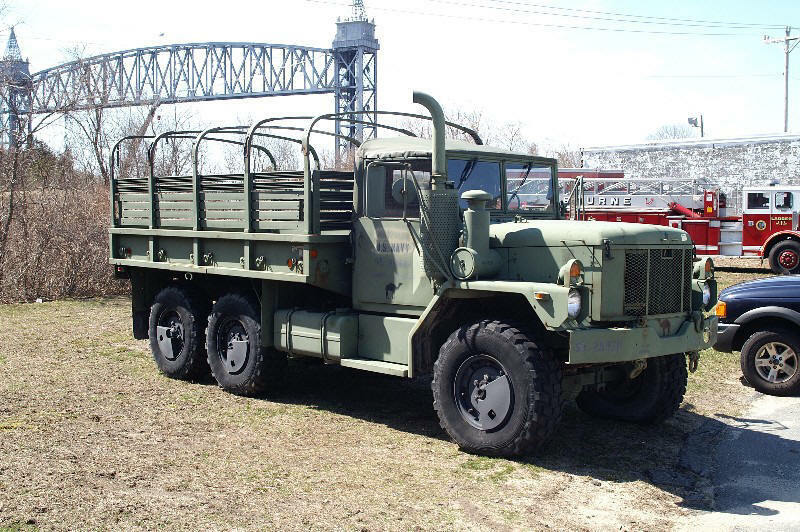 1996 Military 2.5 ton chassis is being converted into a new brush breaker. The new truck will have approximately 750 gallon tank. expected to be used to replace the retired Breaker 128. 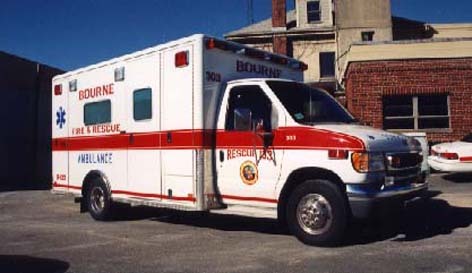 Ambulance in service as A-133. 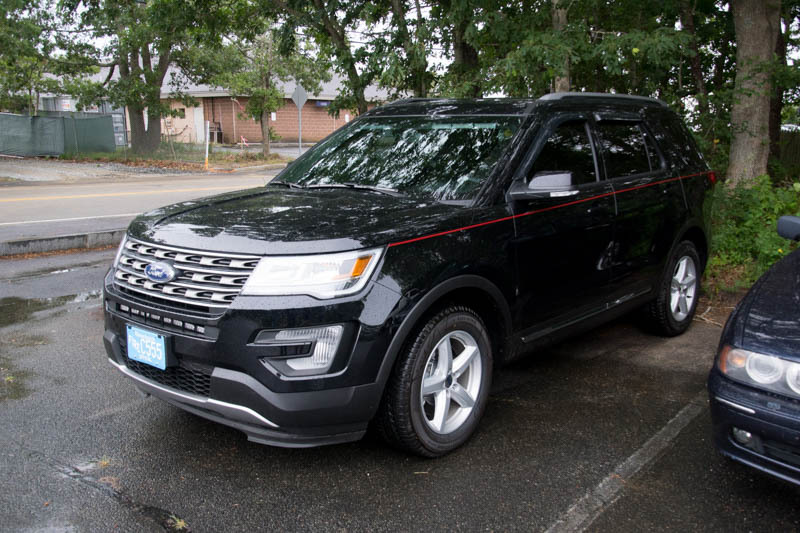 It replaces the 2000 Ford / Horton. 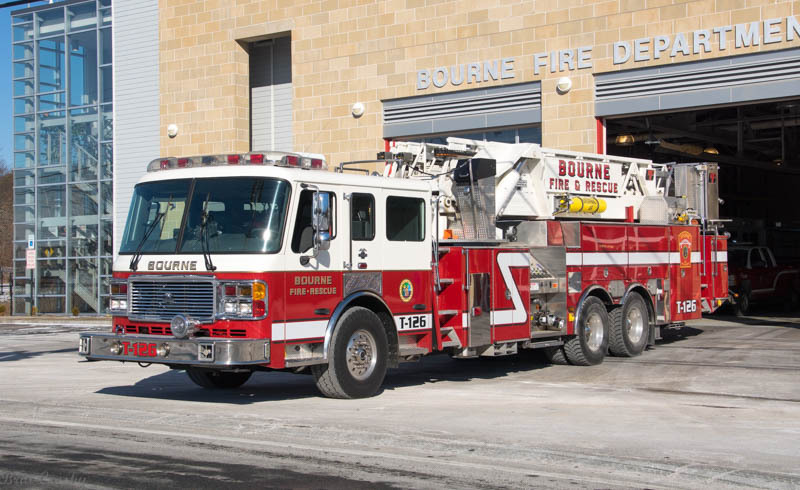 Bourne's new Aerial Tower Quint was delivered in Sept 2006.
it will fit in is the new Sagamore Station 3 and that is where it will be assigned. 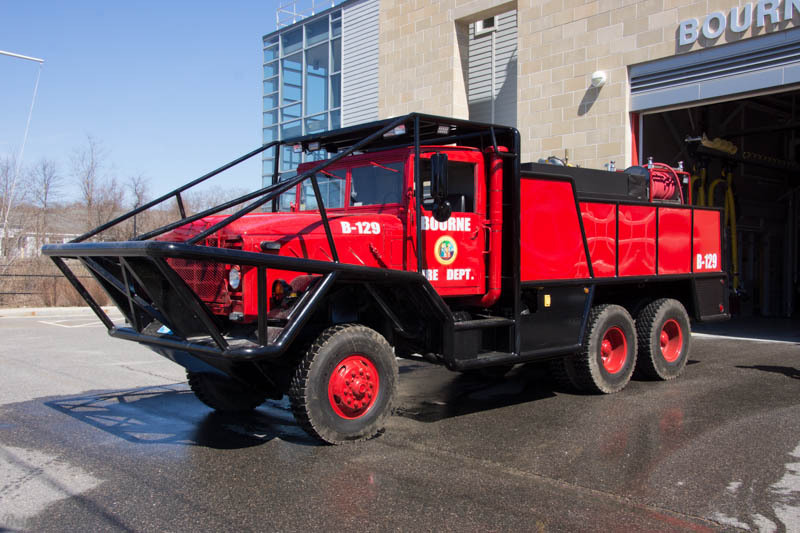 There will be several months of training before it goes in service. 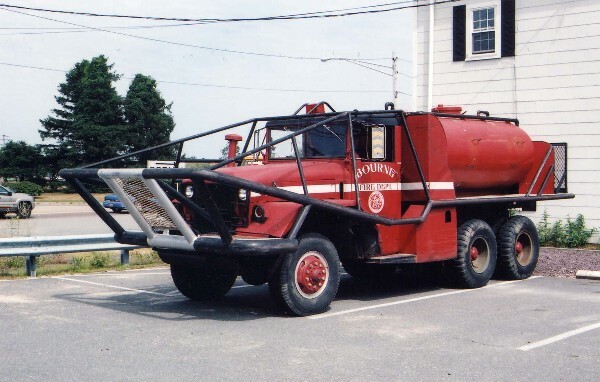 It replaces the 1973 Duplex/Farrar/Grove 85' aerial ladder. 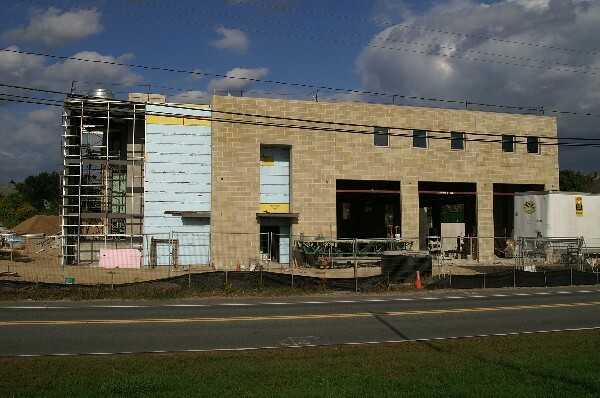 will return to the new Sagamore Fire Station soon. new Engine 123 and had no place to park HM-12. 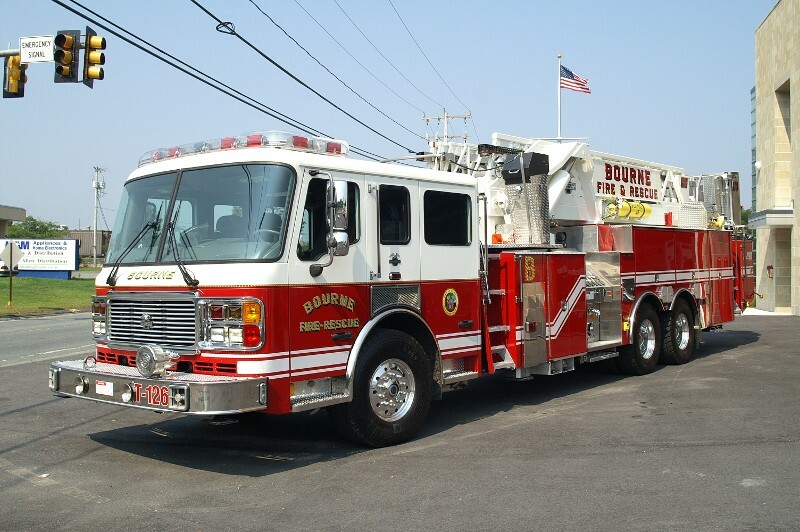 Bourne refurbished the 1998 Ford / Horton with a new 2006 Ford E450 chassis. 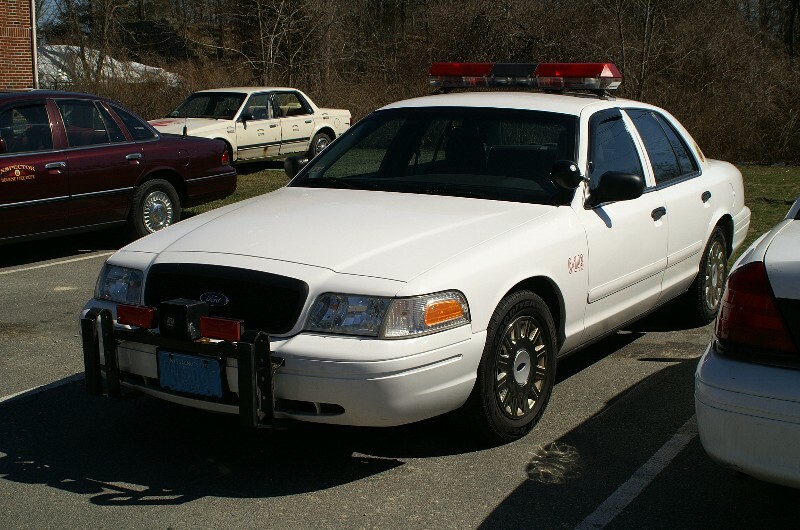 2004 Ford LTD former cruiser. 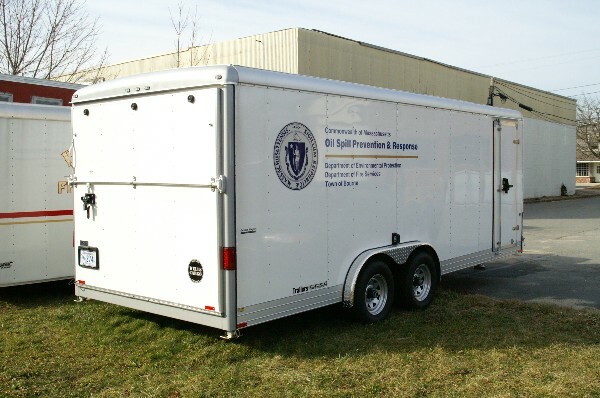 Trailer from the Massachusetts DEP. It is stored at Headquarters. Formerly C141 - Now Fire Inspector Vehicle. 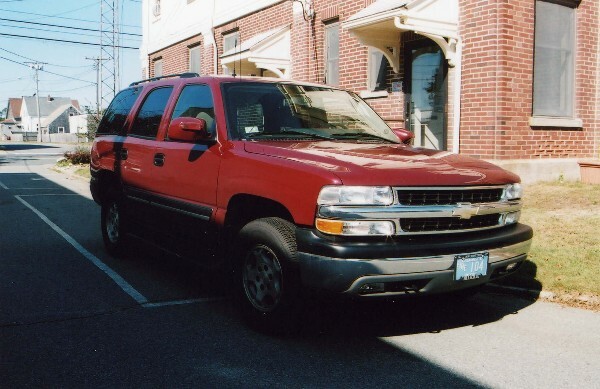 Diesel / standard transmission / no power steering ! This new Breaker has been under construction "for years." It was placed in service Dec 07, 2001 at Station #4. 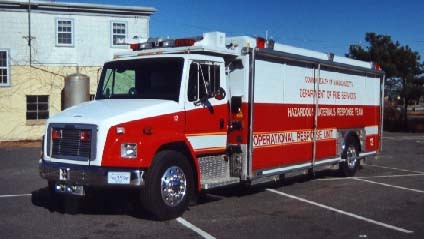 2001 HME / Smeal 1250 gpm - 750 gallon Rescue Pumper. Equipped with foam pro Class A & B foam injection system. The new Engine121 is assigned to Station #1. 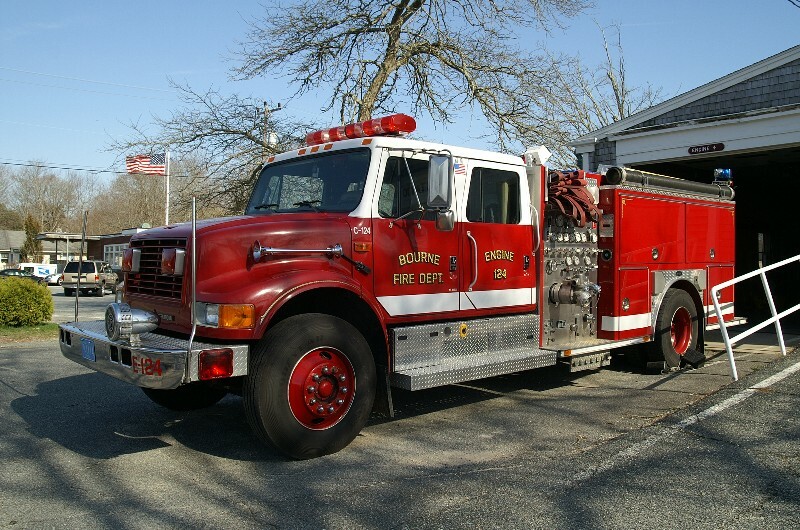 The 1987 Pierce (formerly E121) is now Engine 125 at Station #1. The 1975 Maxim F Engine 125 has been retired. Engine 124 has been reassigned to Station #2. 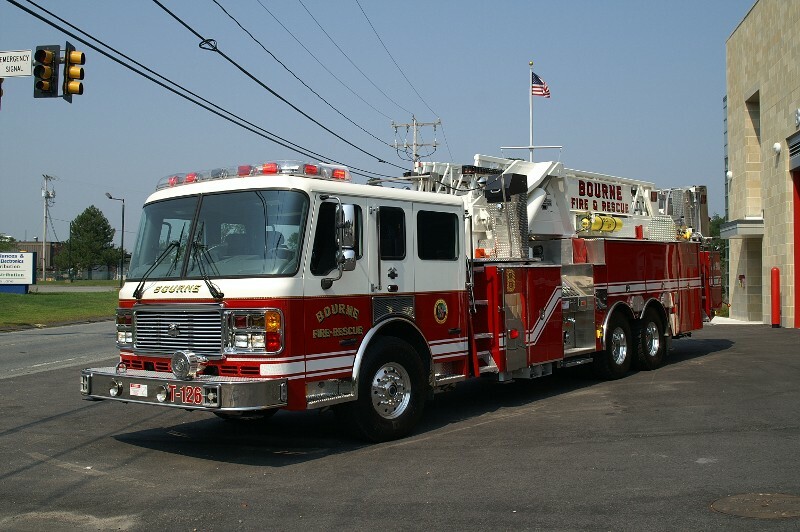 Engine 124 has been reassigned to Station #4.
was removed and the 1971 chassis installed in 2001. 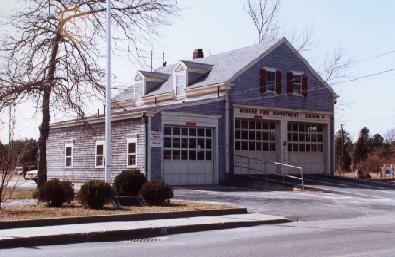 Breaker 129 is assigned to Monument Beach Station #2. 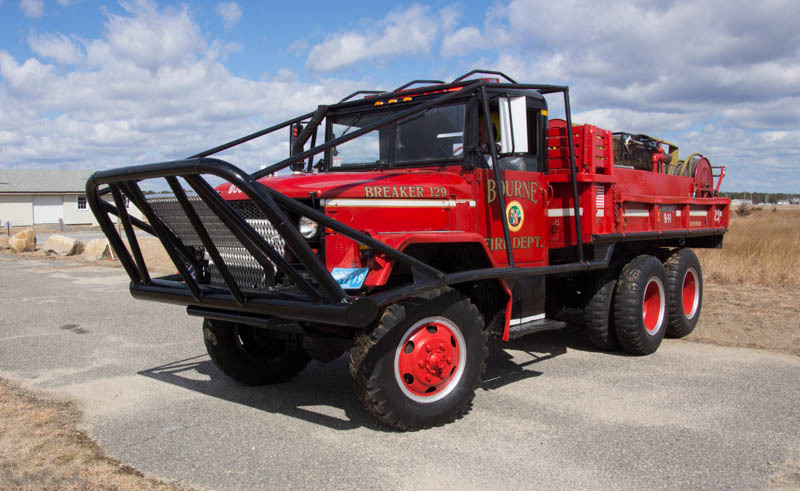 Breaker 127 - Bourne FD has been in the process of building a medium sized brush breaker on an old 1974 Military 2.5 ton chassis for several years. The "new" breaker is NOW IN SERVICE. 12/09/01. 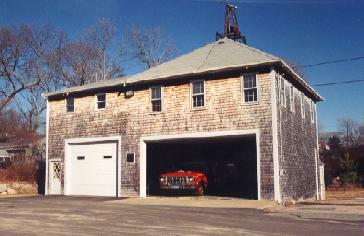 It is presently housed at Bourne Station #4. Its permanent assignment is yet to be announced. 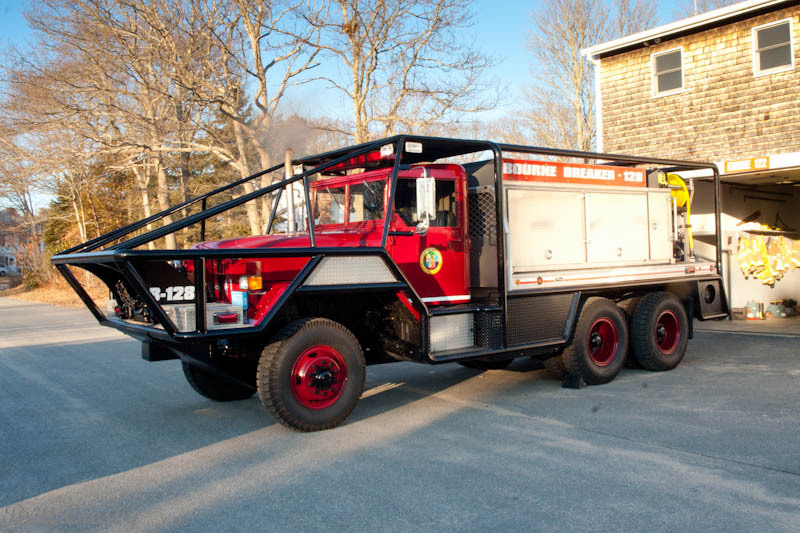 Breaker 128 - Bourne's 1967 Kaiser Military 6x6 Brush Breaker with bar work done by Ted Young may be nearing retirement. 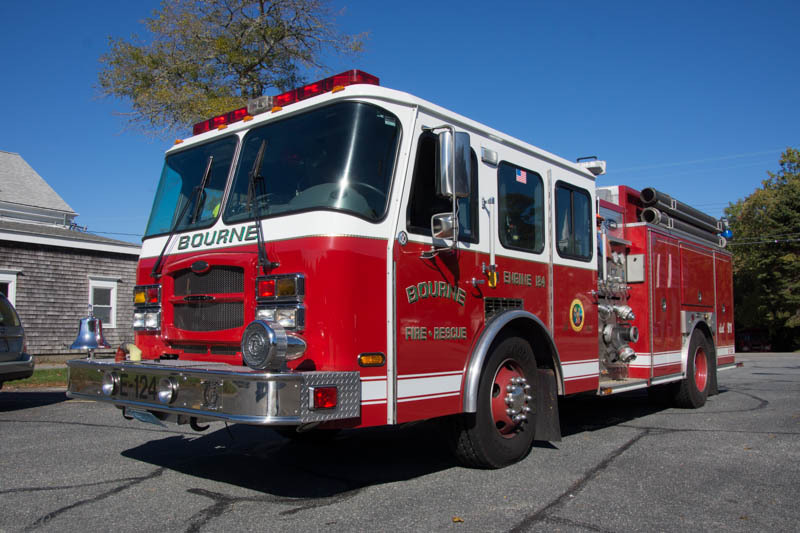 In service with Bourne since 1975, its water tank is failing and the apparatus is out of service more often than in service. 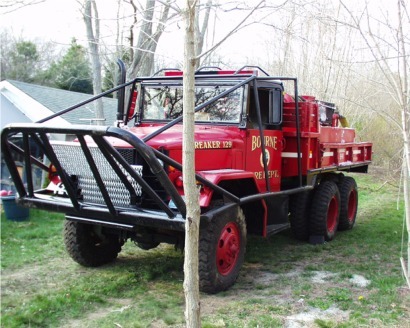 This truck has served well as one of the larger breakers in the area for many years of serious forest fires in the Cape and Plymouth area. 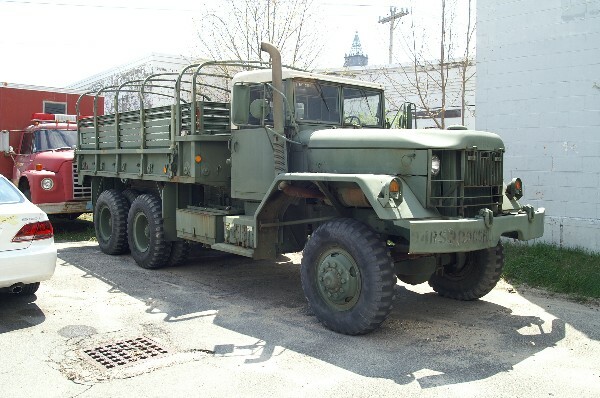 Breaker 129 - A 1971 Jeep Corp. Military 2.5 ton chassis with a diesel engine and standard transmission was recently (2001) put in service under the former body of Breaker 129 which had been on a 1952 Reo Military chassis. The new B129 has a new paint job with a black roof. 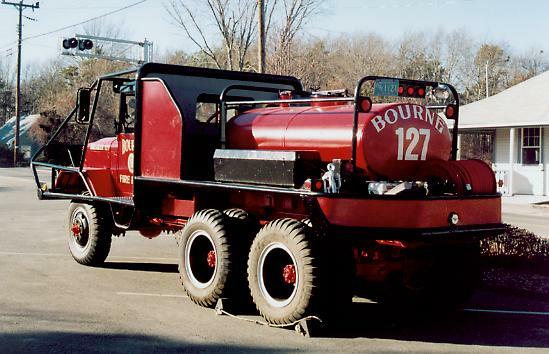 PUMPER TO RETIRE - The 1975 Maxim F Engine 125 has been retired (Feb 2002). 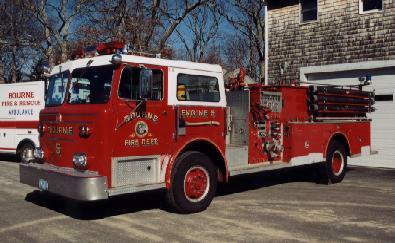 This pumper, which served initially as Engine 6 and then as Engine 5, was in recent years assigned to the Monument Beach Station 2. It has a lot of body rot and will be retired. 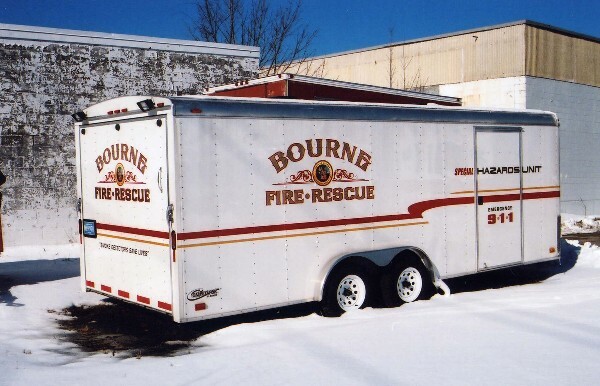 Bourne moved several of its apparatus around in recent years. 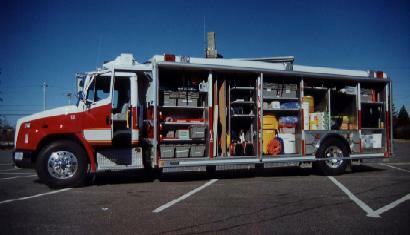 Engine 122 (the 1994 International/E-One) was moved from Station #2 to Station #4. 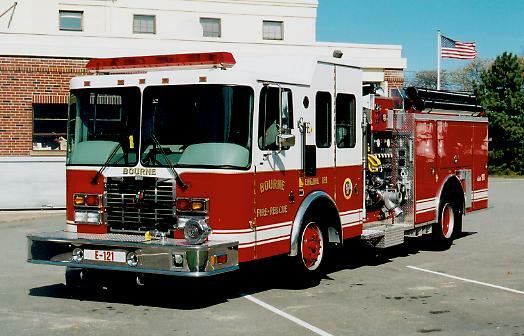 Engine 124 (the 1995 International /E-One) was moved from Station #4 to station #1. Both Engines carry jaws tools. 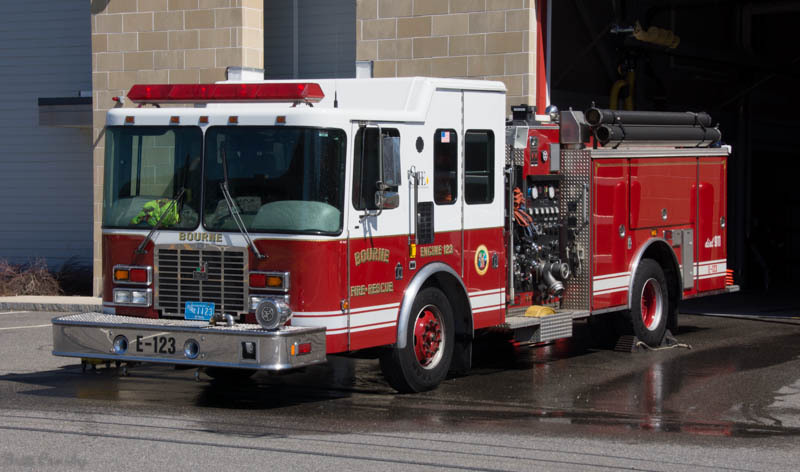 Engine 125 (the 1975 Maxim F) was moved from its duty as Jaws Engine at Station #1, was reassigned to Station #2 (in a semi-retirement mode). 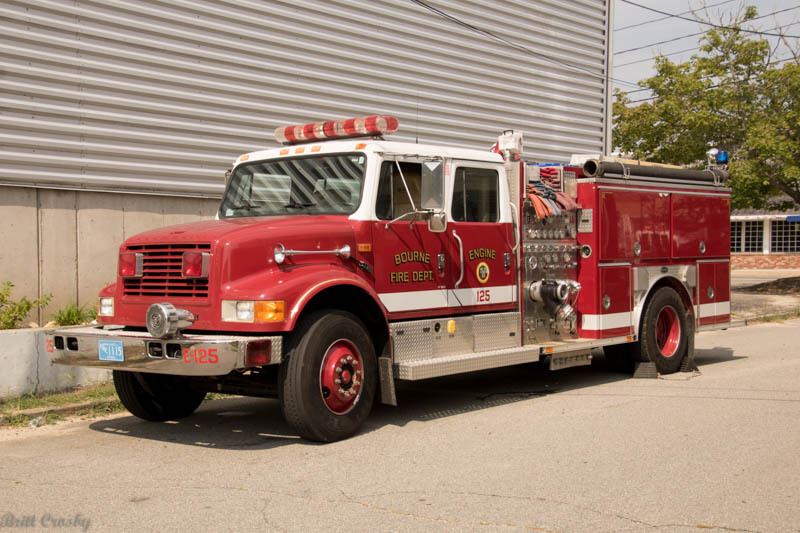 Squad 131 (the 1979 Ford/Pierce Mini Pumper) was reassigned from its long time assignment at Station #3 to Station #2. This move was necessitated by the assignment of an ambulance at Station #3. 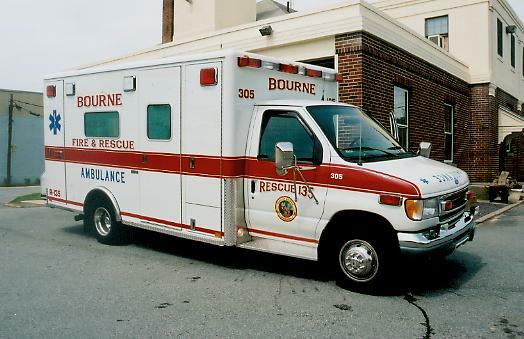 Bourne placed Rescue 133 (EMS 303) in service at Headquarters in 2000. 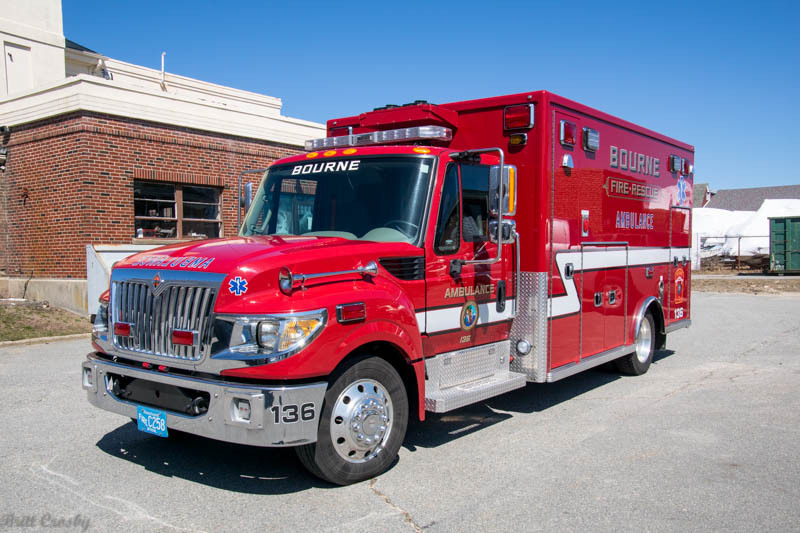 The 2000 Ford E450 Super duty / Horton Type III Ambulance becomes the fourth Ambulance in Bourne's fleet. 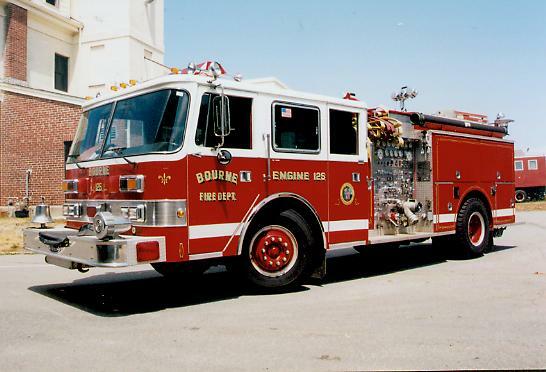 R133 was reassigned to Station #3 in 2001. 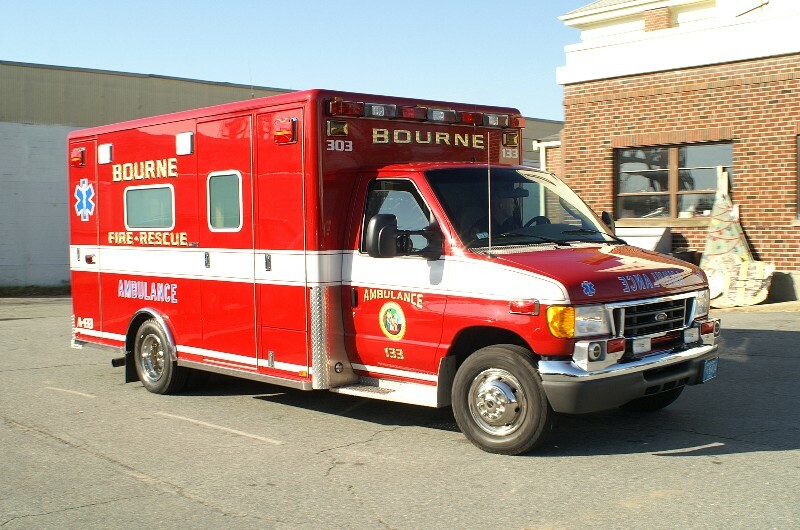 Bourne Rescue 134 (EMS 304) is a 1999 Ford E450 super duty / Horton Type III Ambulance. 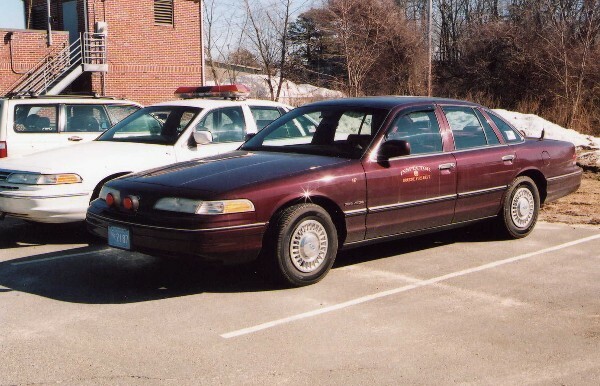 Purchased in 1999, it is assigned to Pocasset Station #4. 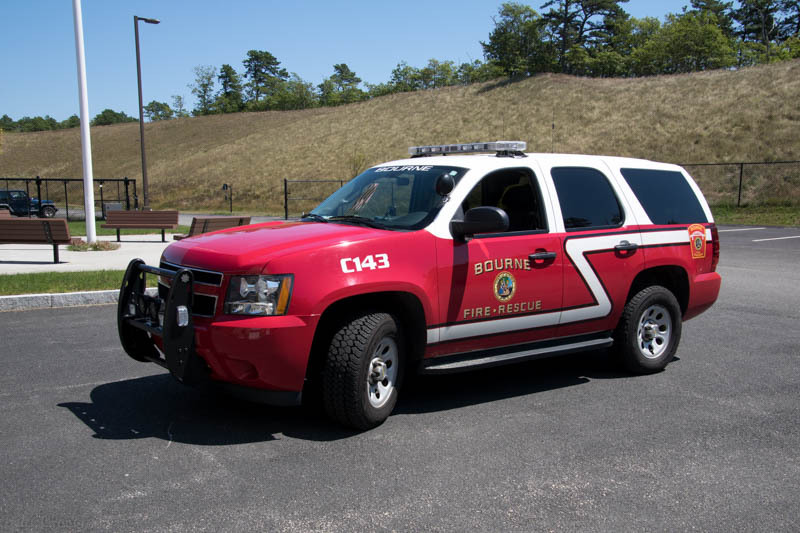 Bourne Fire Department has a committee looking into a new "south side" fire station that would replace the current Station 2 in Monument Beach and Station 4 in Pocasset. The 2 older stations would be replaced by a single new station. A few options for location are being evaluated. 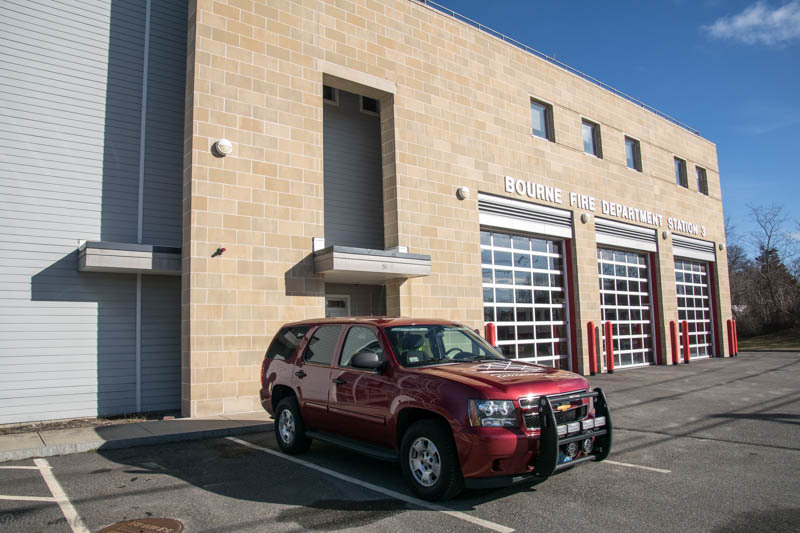 The Bourne Fire Department has moved its Headquarters offices from the 130 Main Street, Buzzards Bay Station #1 TO the 51 Meetinghouse Lane, Sagamore Station #3. The move was made officially on Jan 1, 2017 and includes offices of the fire chief and administration for permits, inspections, etc. 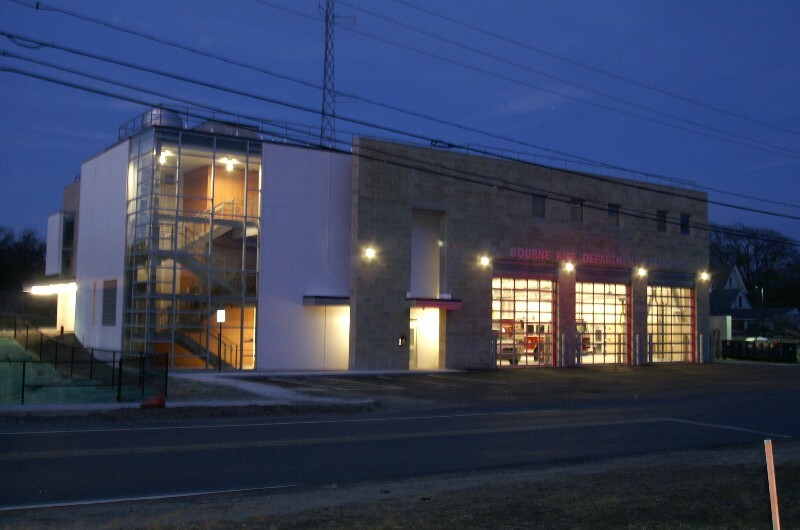 The newer station in Sagamore was opened in 2006 and is up to code relative to ADA and fire safety standards. The older station had offices on the second floor, but lacked any means for some disabled citizens to reach them. A new phone number has also been activated: 508-759-0600. 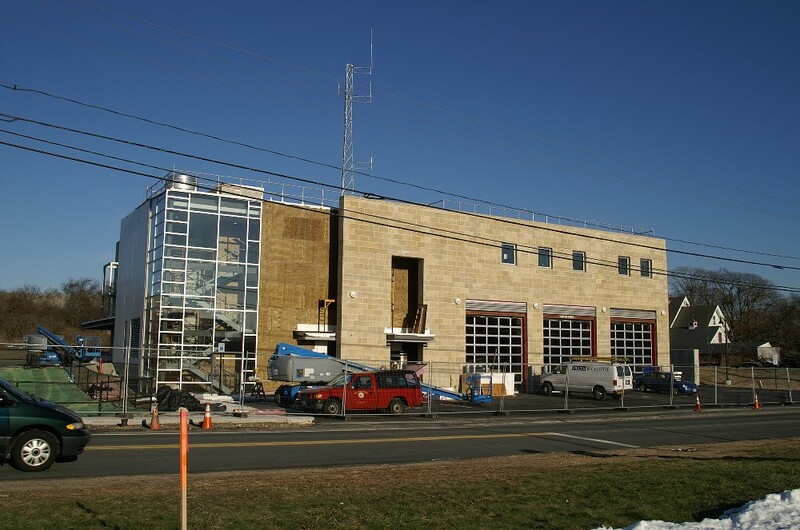 New Bourne Station 3 opened March 10, 2006. 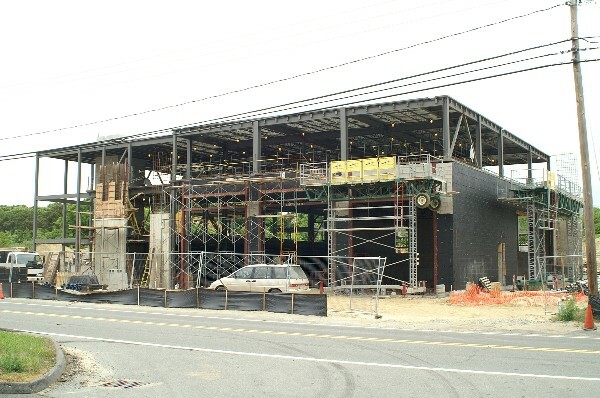 June 2005 - Soon to be replaced Sagamore Fire Station 3 and Sagamore Rotary. 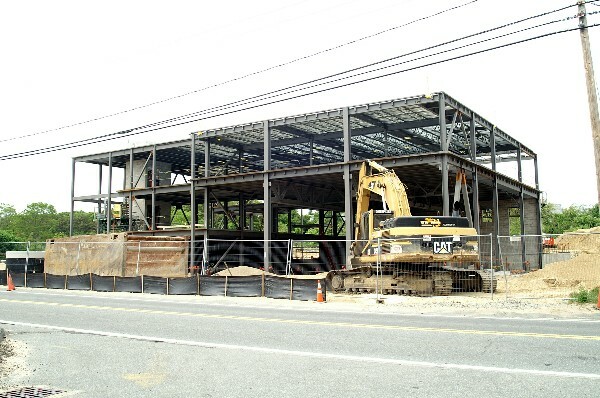 Construction has been underway at the Meetinghouse Road site. 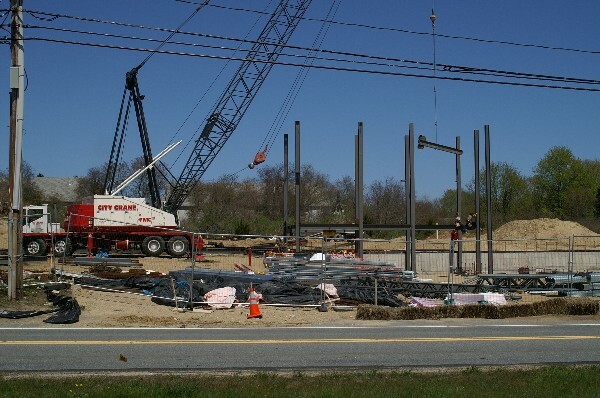 Steel began going up last week. 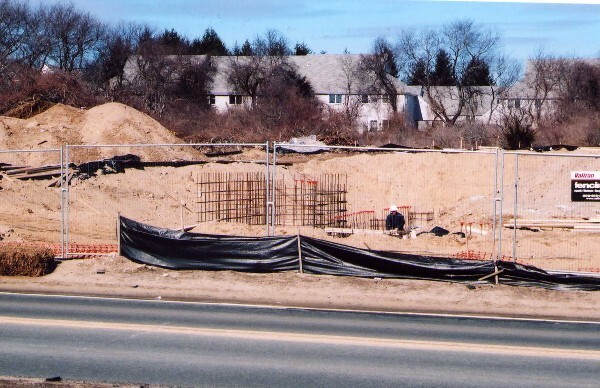 Footings are in and foundation is starting to take shape. Post Office. 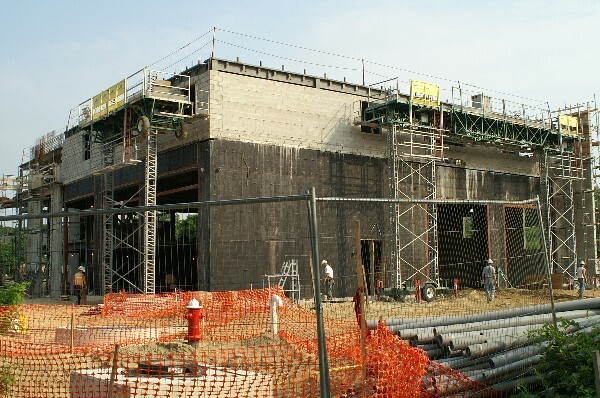 Construction began in the winter of 2005. Station #3 at the Sagamore rotary early in the morning July 15, 2004. 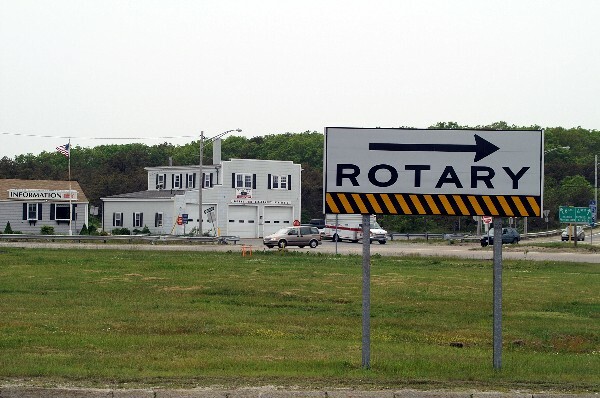 'flyover' project to remove the rotary begins. 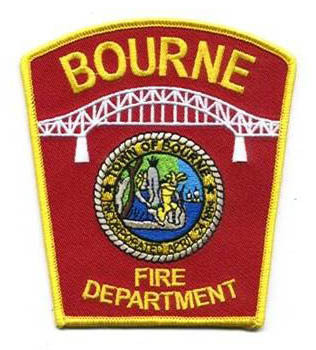 Bourne FD will be promoting Deputy David Cody to Asst Chief, Lt Ryan Haden to Deputy Chief, and FF Gil Taylor to Lieutenant at a ceremony on April 6, 2018 at 1000 hrs. 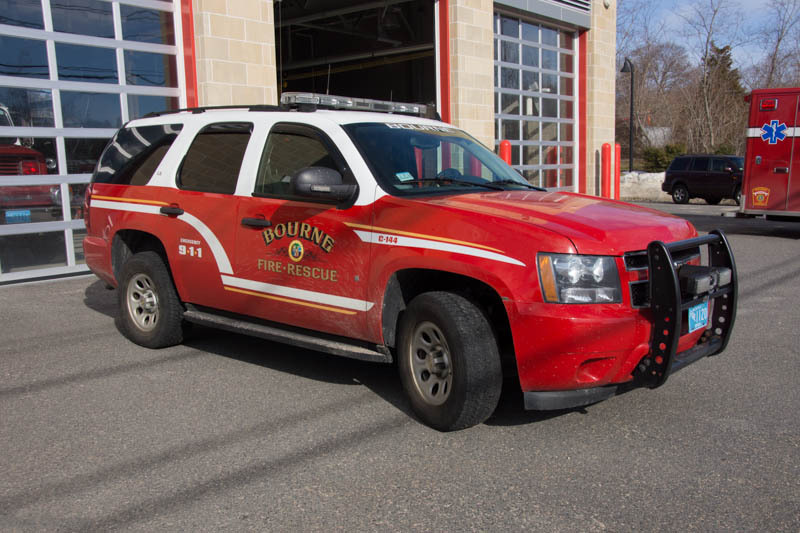 The Bourne Fire Department has created a new administrative position to help manage the 65 member department. The non-union Assistant Chief position has been filled by the promotion of Deputy David Cody to Assistant Chief as of Feb 12, 2018. He will be designated as Car 142. 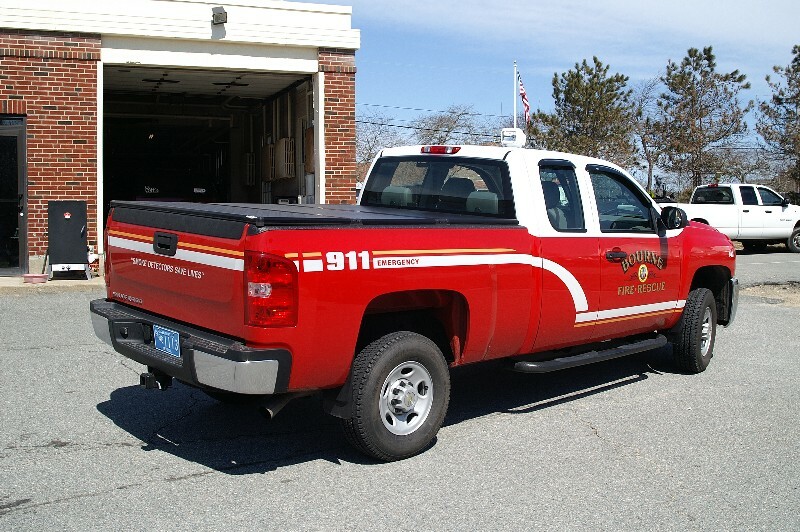 The Assistant Chief will be assigned to Station 1 in Buzzards Bay. Congratulations! Bourne Fire Department announced the sudden passing of off duty active Firefighter / Paramedic Chad Cerulli, age 40, on September 1, 2017. 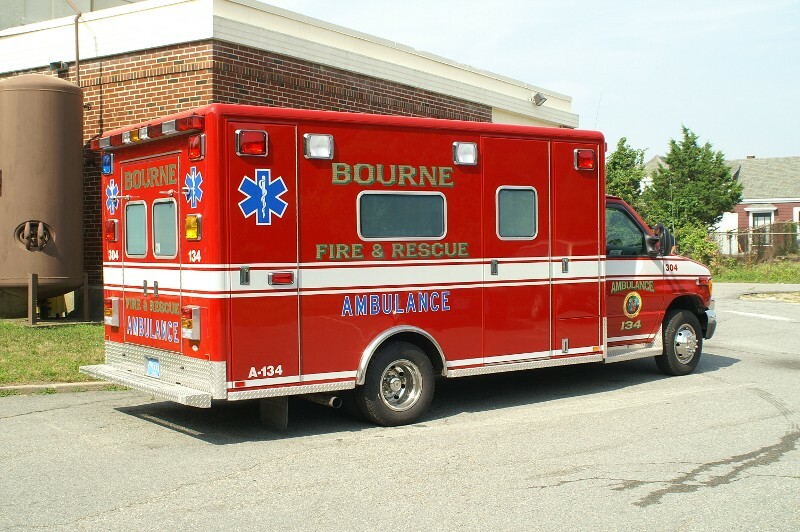 He was a 6 year member of the Bourne FD. 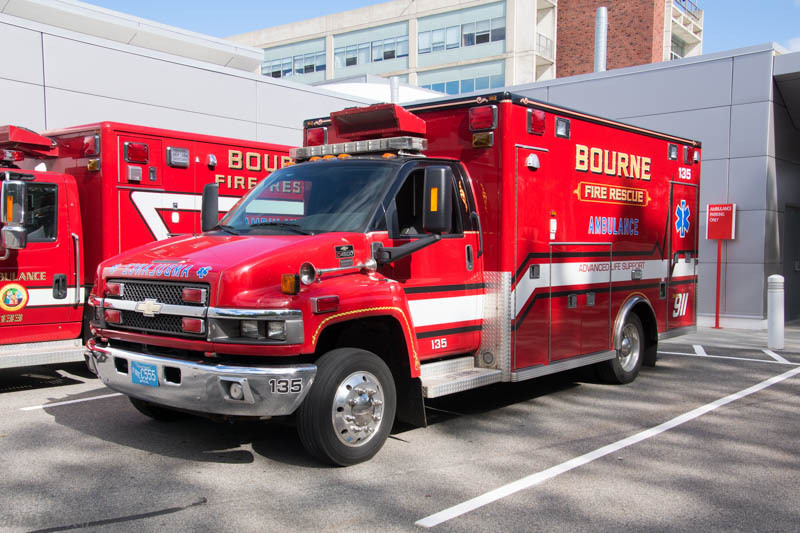 An update on the staffing situation in Bourne. 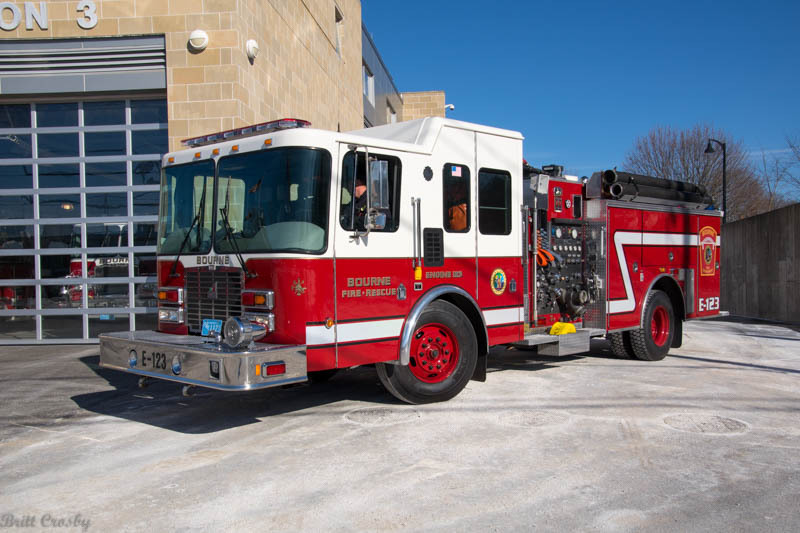 According to reports, the town has found a way within the budget to avoid fire department layoffs and the subsequent losing of a $1.3 Million federal SAFER grant for staffing. A $2.7 Million prop 2-1/2 override vote failed in October and threatened 8 fire department positions. The department will NOT have to do any layoffs or station closings. 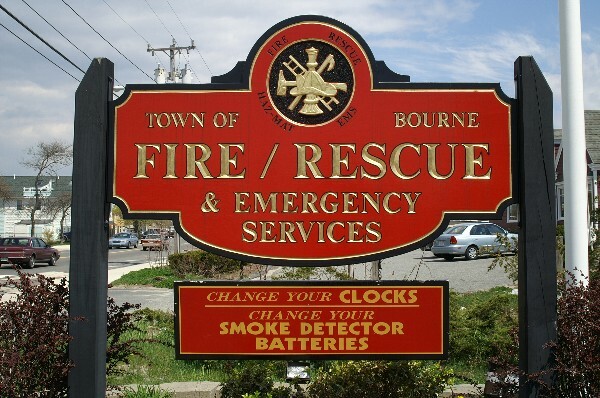 The town of Bourne has voted to cut its budget rather than approving a Prop 2-1/2 override. 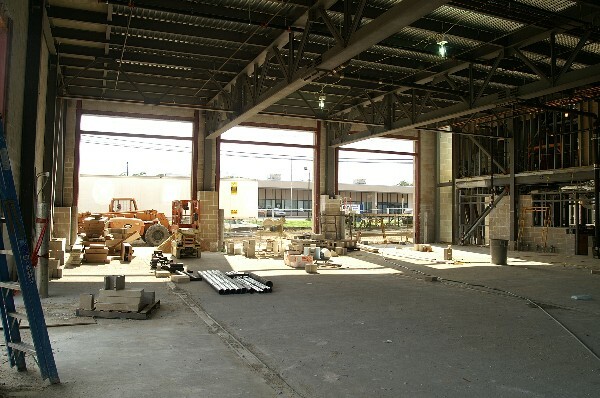 The impact on the town and the services provided could be very significant. 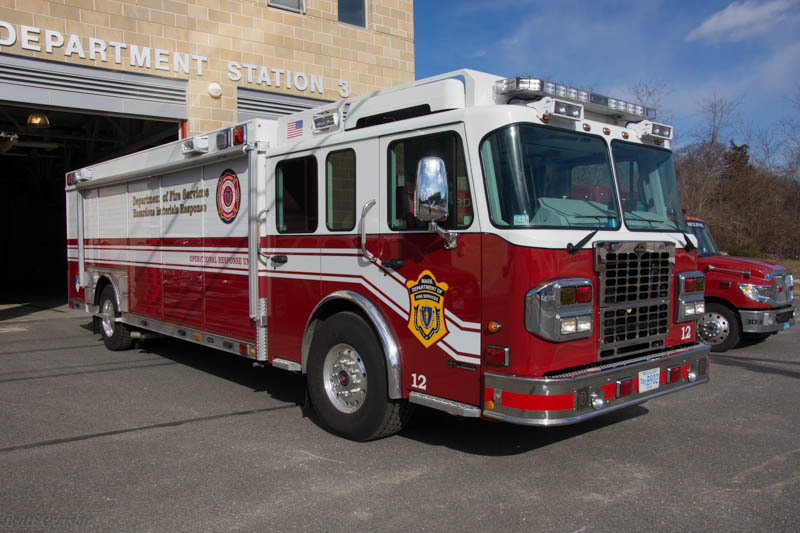 The Fire Department could loose 4 positions due to the cuts, but the impact could be much worse since a Federal grant has covered the cost of 8 other firefighter/paramedics for the past couple years. The grant is subject to the town picking up the full cost after 3 years which is coming to an end. 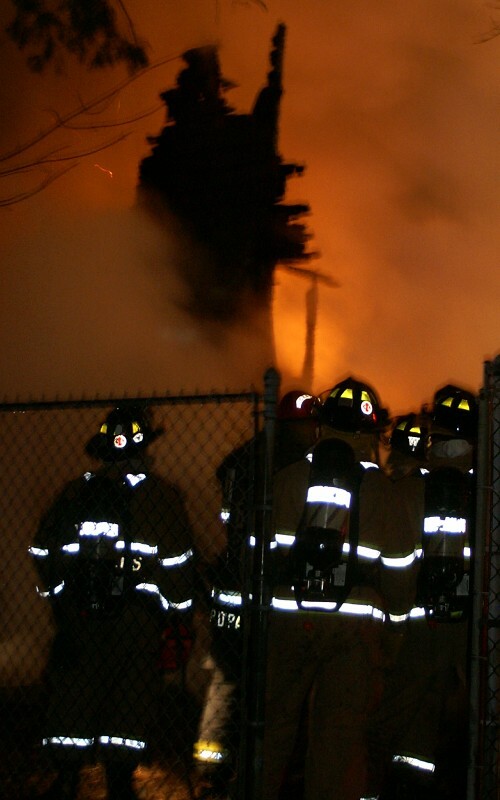 Loosing 12 personnel is the same as loosing 3 per shift from a department that has a maximum of only 11 personnel on a shift to cover 3 of their 4 stations with basic 24 hour staffing. A similar cut of 12 personnel in 1991 devastated the department for years closing the Pocasset station (the only staffed station south of the canal) and the Sagamore station to the east. Response times to some calls increased from as few as 2 or 3 minutes to 15 or 20 minutes or more in some cases during multiple calls. 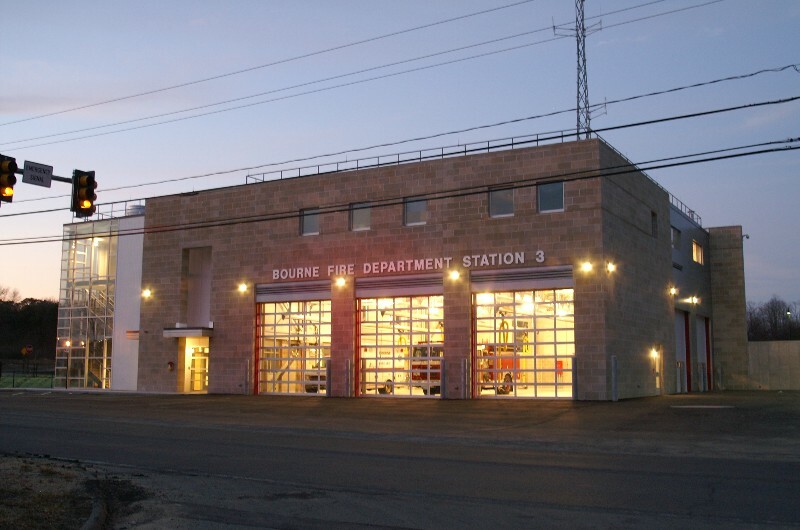 At best Bourne has a Deputy, Lieutenant, and 3 Firefighter/Paramedics at Station 1, a Lieutenant and 2 firefighters at Station 3, and the same at Station 4. Often less personnel are on duty due to scheduled leaves, illnesses or injuries with a minimum of only 9 personnel on duty in town. The department has already cut 1/3 of the Lieutenant positions out of the budget and routinely only maintains 2 personnel at Station 3. 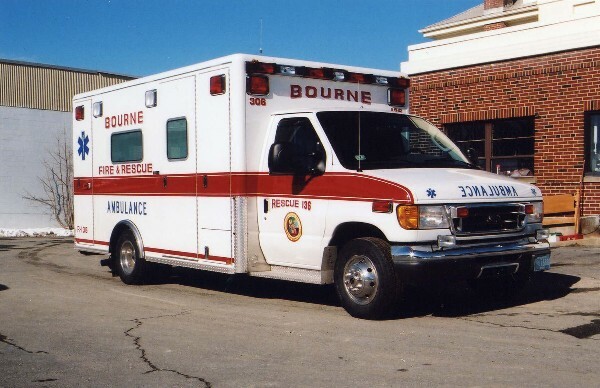 Bourne responds to approximately 4,600+ emergency calls annually, more than 2 times as many calls as they handled in 1992 (1,753 calls). Many of these calls occur simultaneously which can greatly increase response times to medical emergencies throughout the town. 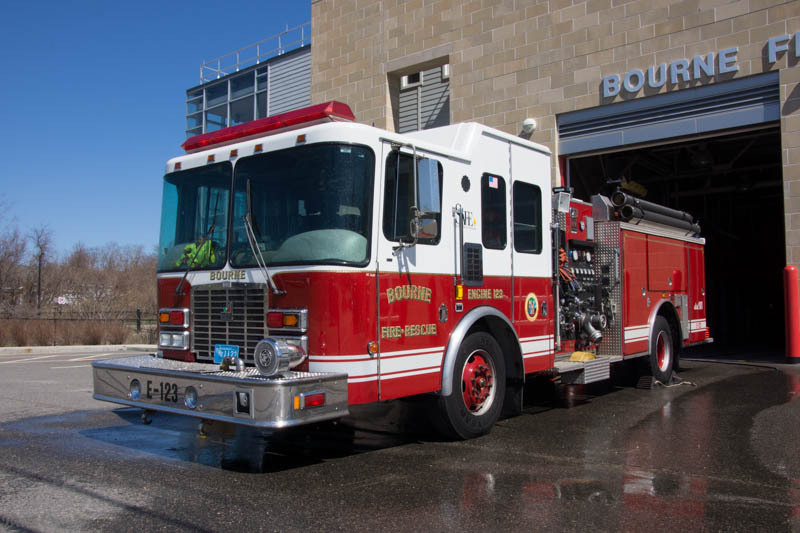 Loss of personnel or closing of stations would make it difficult for the town to provide the most basic emergency services to its citizens..
Bourne has appointed Norman "Spanky" Sylvester Jr as the new Fire Chief. 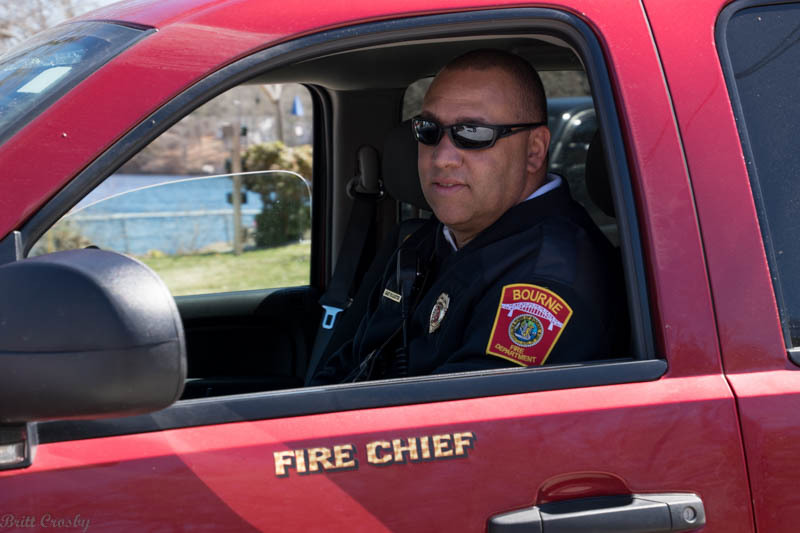 Chief Sylvester started out in Wareham and then joined the Hyannis FD where he served as a Firefighter/Paramedic for many years. He was promoted to LT about 3 years ago and has most recently served as a Fire Prevention officer in Hyannis. He is also a long time member of the Mass Dist 1 Haz Mat Team. He was appointed chief Feb 28, 2015. 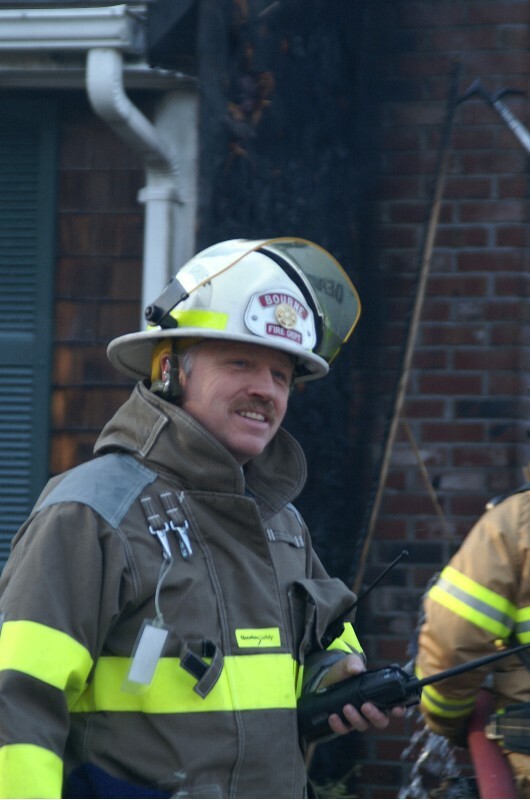 He replaced Fire Chief Martin Greene who recently retired after 33 years with Bourne FD and as Chief for the past 4 years. Deputy Chief David "Skip" Kingsbury will be retiring effective Sept 2014. 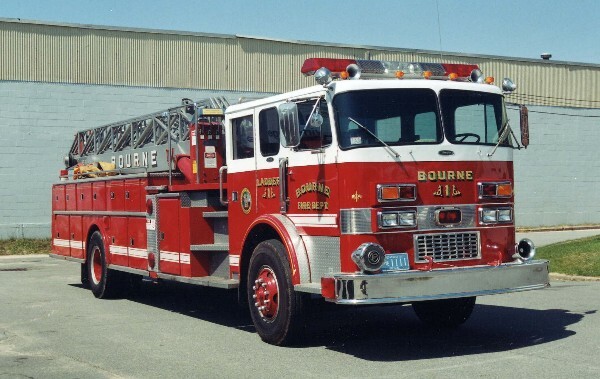 He joined the Bourne FD in Sept 1982 and served all ranks including serving as the Acting Fire Chief for several years. Congrats and best wishes! Lt. James Brown also recently retired. 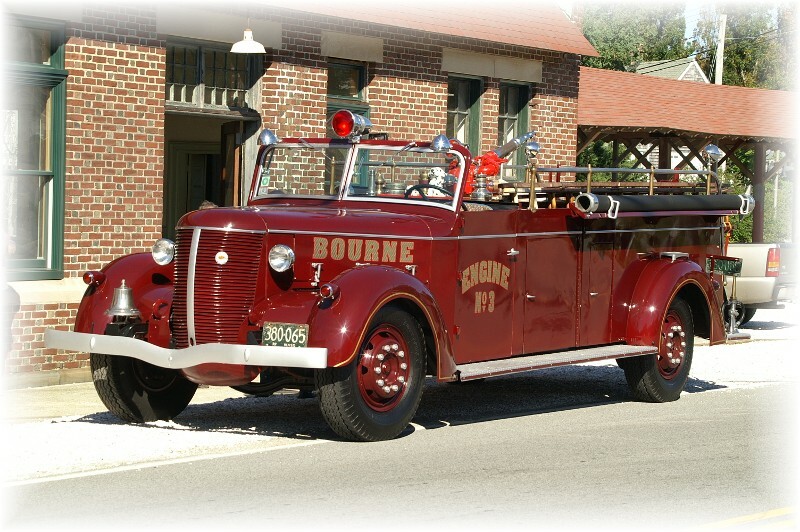 He joined Bourne FD in 1985 and retired in July 2014. 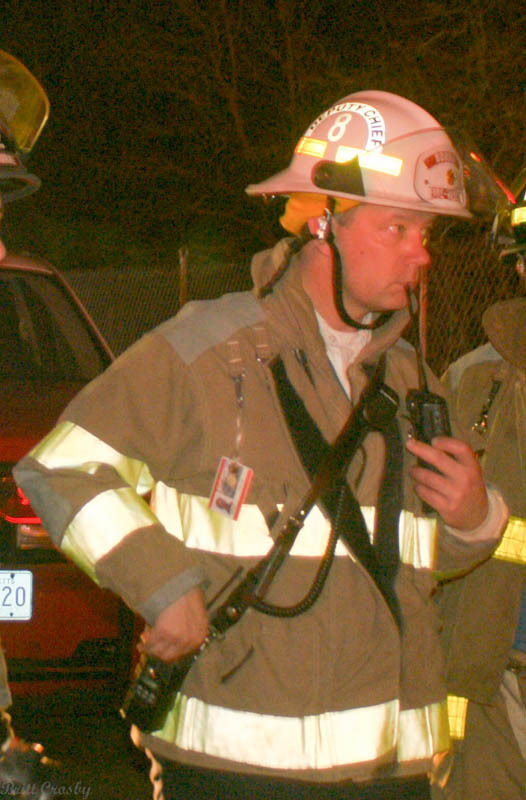 Fire Chief Martin Greene has also announced his intention to retire in early 2015. 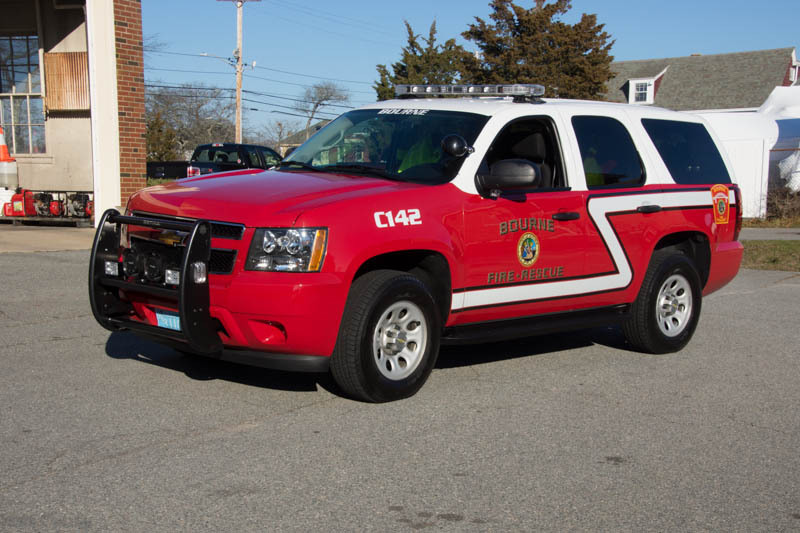 Bourne FD received a SAFER grant that enabled the busy department to hire 8 additional personnel and appoint 8 new Lieutenants. 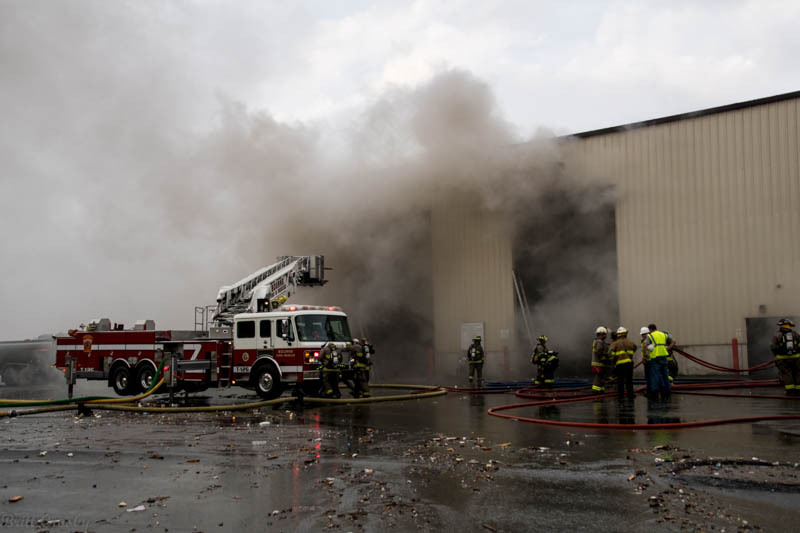 Previously, the department had 4 shifts of 9 personnel. 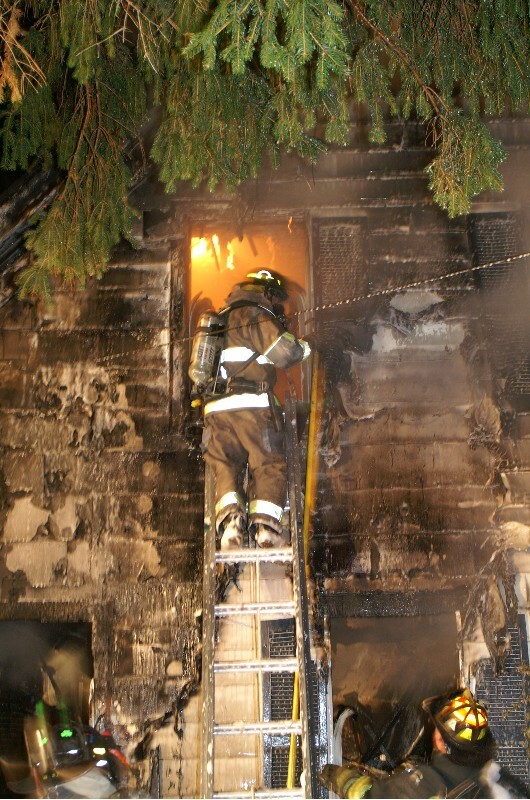 Typically being a Deputy shift commander at Station 1, a duty Lieutenant at Station 1, 3 firefighters at Station 1, 2 firefighters at Station 3 and 2 firefighters at Station 4. With only 2 officers on duty, nearly every call in town required the response of either the Deputy or Lieutenant from HQ in a second vehicle. 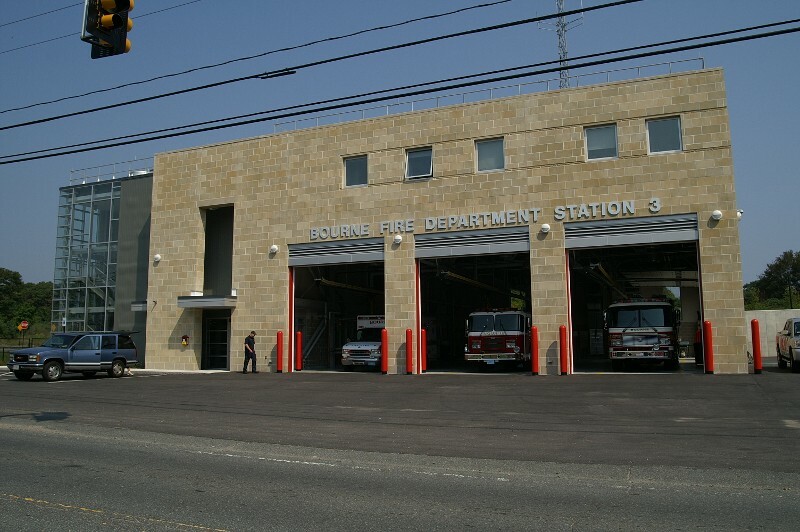 The additional personnel bring normal shift strength up to 11 on duty, with the same staffing off Station 1, but now 3 personnel at both Station 3 and 4, including a Lieutenant at each. 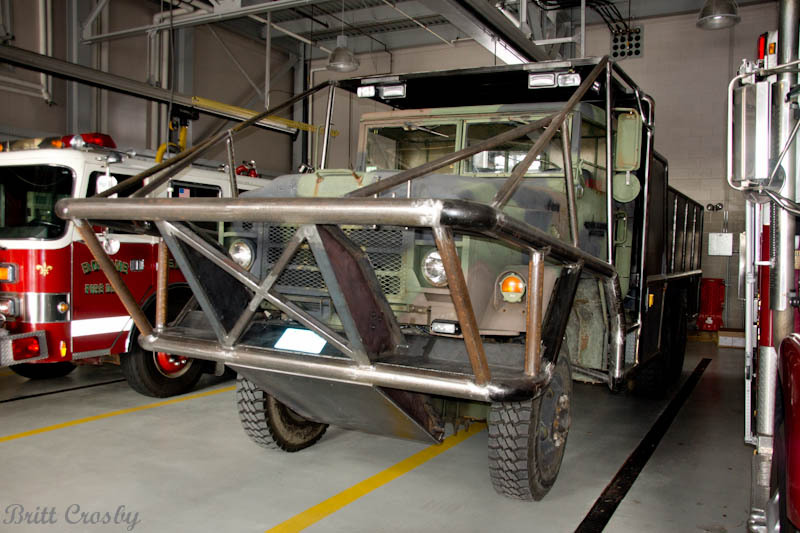 This reduces the amount of vehicles on the road for most runs and provides a degree of efficiency and safety that come with sufficient staffing. 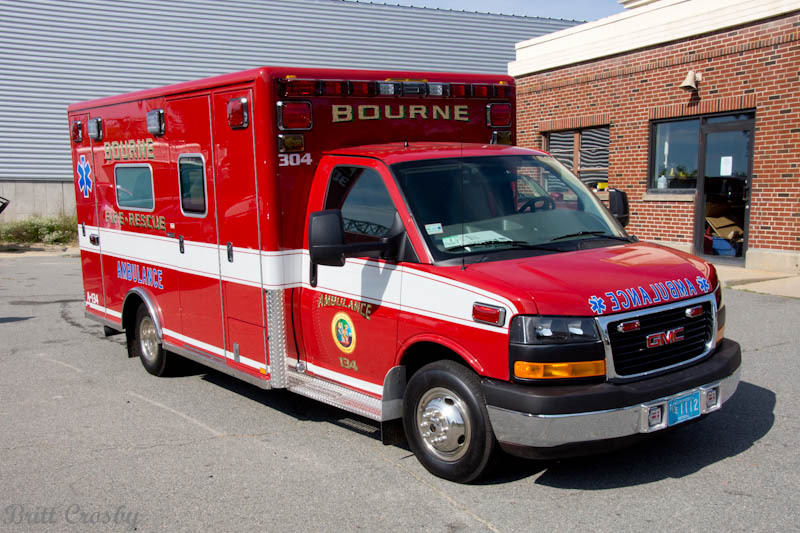 Bourne Fire Department Deputy Chief Daniel Doucette has announced his pending retirement after many years with the Bourne FD. . Deputy Doucette was a paramedic for many years and also served several years as acting chief. Congrats and best wishes to him! 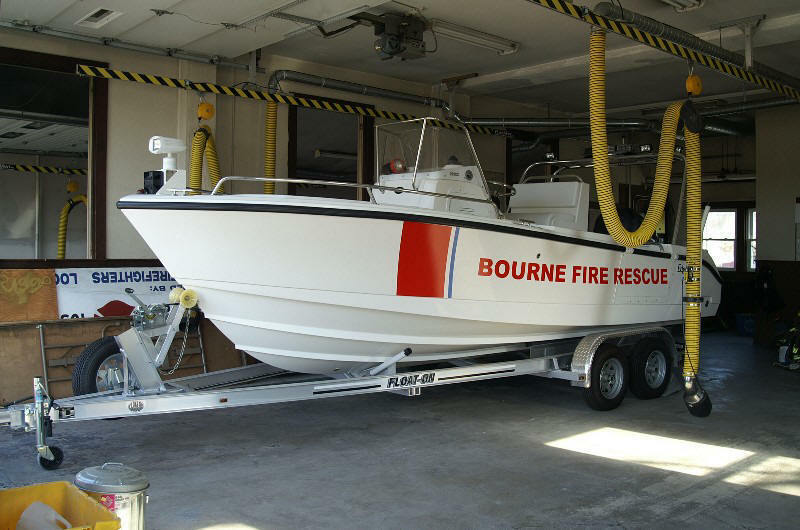 Bourne has announced the appointment of Martin Greene as the new fulltime Fire Chief in Bourne effective January 2011. A swearing in will be held on Monday January 24th. Acting Chief Daniel Doucette will return to his Deputy position. Acting Deputy Paul Weeks returns to his Lieutenant position. Regrets to announce the passing of retired call Captain Edward Braley on June 12, 2009. 25 of which as Captain at the Monument Beach Sta 2. Wake Tuesday June 16, 4-7, Nickerson Bourne Funeral Home, MacArther Blvd. burial to follow at Monument Beach cemetary. Capt Braley was father of Plymouth Batt Chief Dan Braley and Fire Marshal Trooper Ken Braley. and several decades on the department. until a new chief is selected in the Spring of 2007. 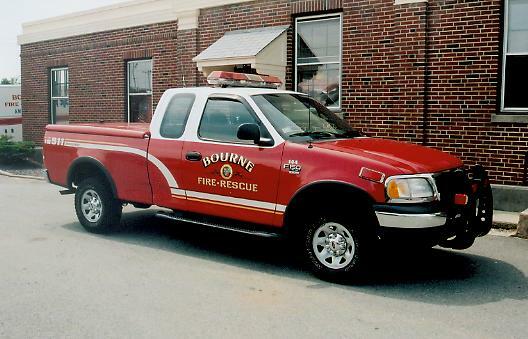 Bourne Fire Department Deputy Chief Robert Berry passed away on April 21, 2006 at age 54. He was still an active member of the department when diagnosed with cancer. Deputy Berry was a former Army vet serving in Viet Nam. 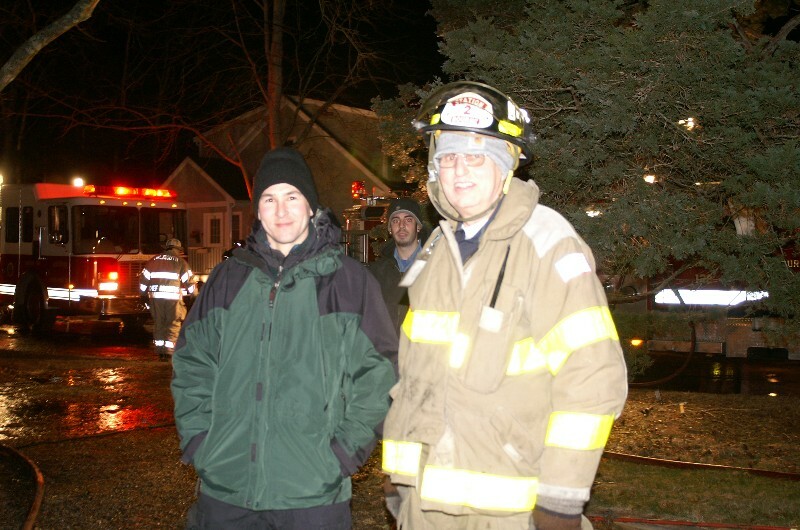 He was the lead investigator for Bourne FD. Full department honors were provided during the funeral service on April 26, 2006. 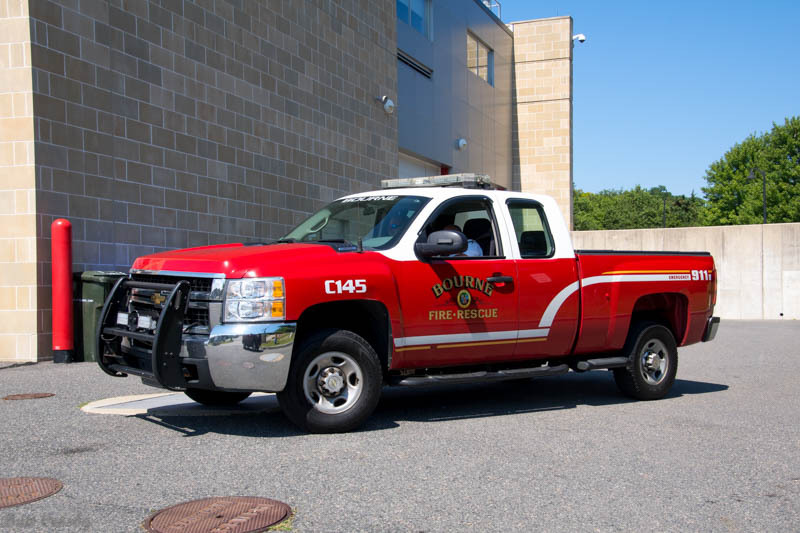 Bourne Fire Department Firefighter William "Billy" E. Palmer was buried with full department honors on November 23, 2005. FF Palmer died from cancer at age 57. He was the senior active member on the department with 35 years of service at the time of his passing. He also served in the Army as a Sergeant and was buried at the National Cemetery at Otis. 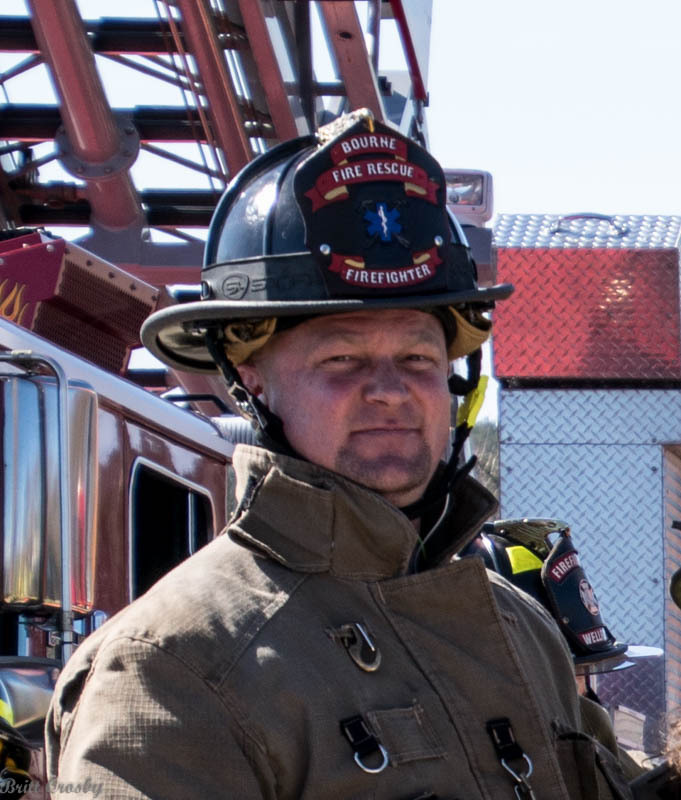 Charles Klueber has been appointed Fire Chief of the Bourne Fire Department. 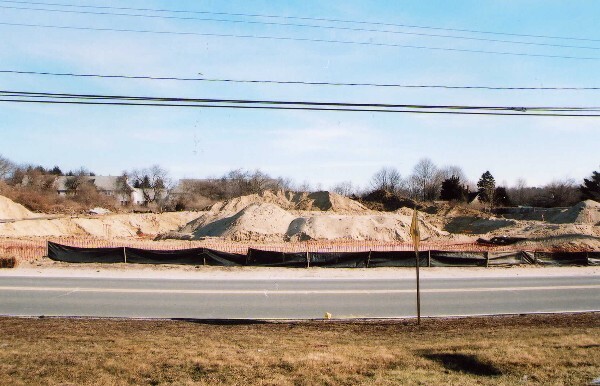 (2002). 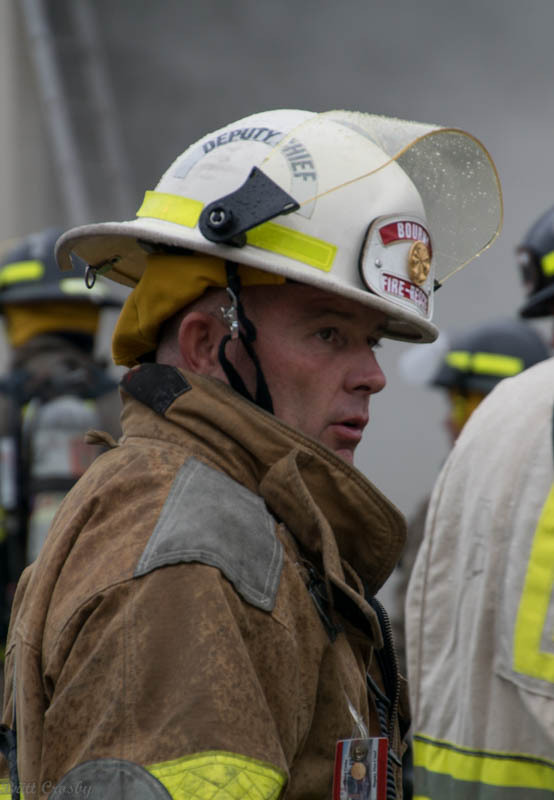 He worked his way through the ranks in Bourne, serving for a number of years as Deputy Chief, and most recently serving as acting chief since 1999. 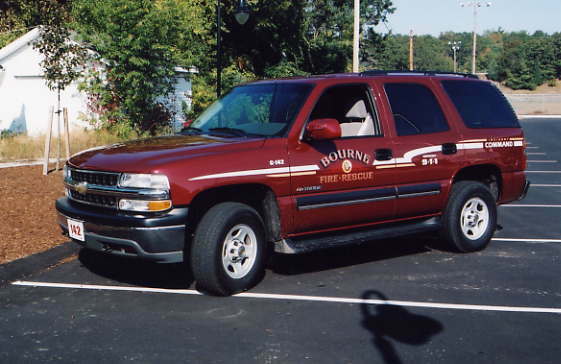 Bourne Fire Department responded to 3,005 incidents in 2001, an increase of 66 runs from 2000. The increase of 2.2 % represents an average of 8.2 responses per day in Bourne. 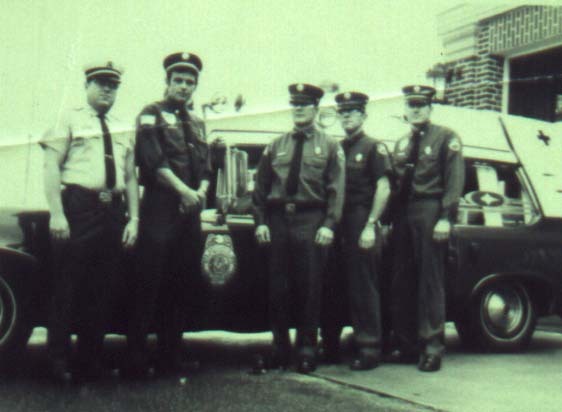 Bourne Fire Department personnel in 1972. 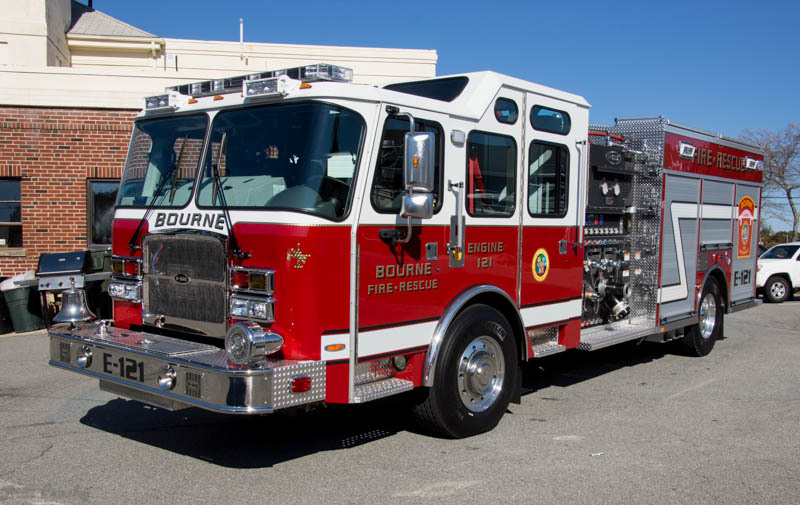 The Bourne Fire Department is bracing for the unimaginable devastation that will accompany a failure to pass a Prop 2-1/2 override this October. 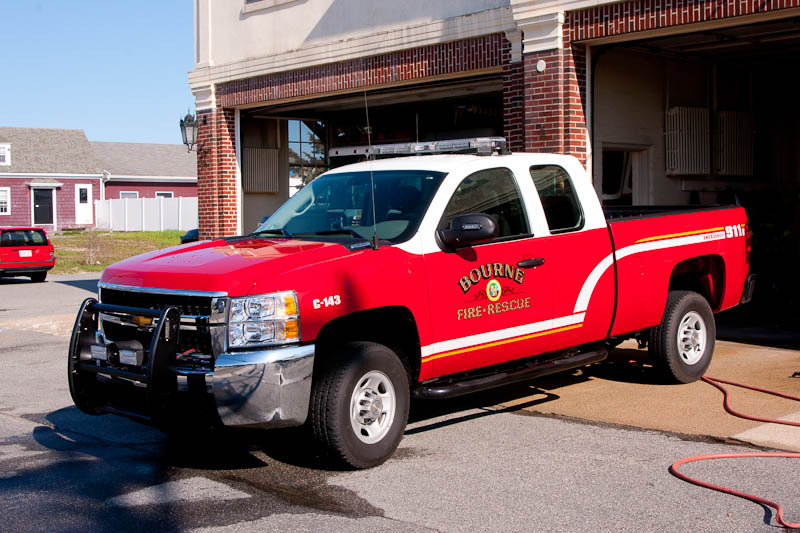 The fire rescue department covers 41 square miles and protects a year round population of over 18,000 residents. 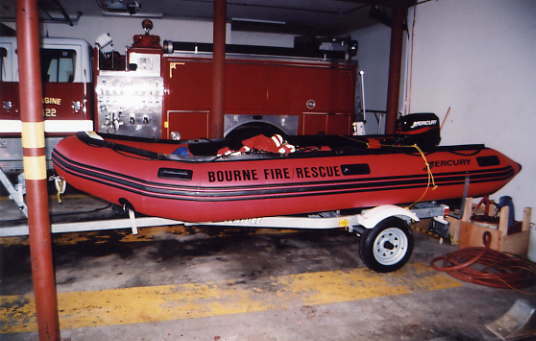 Bourne responded to approximately 3,444 emergency calls in 2004 (#7 busiest on Cape, up over 100 calls from 2003). 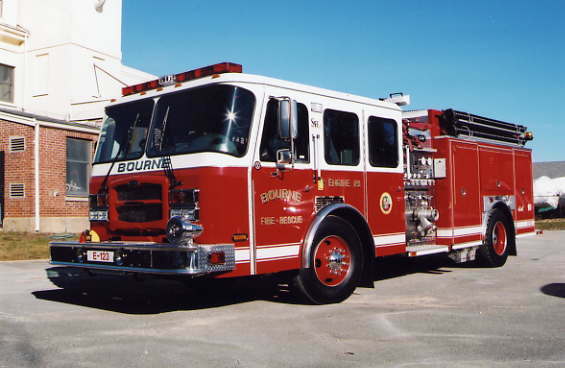 All personnel in Bourne, as in other Cape towns, are cross trained in firefighting and as emts and paramedics. 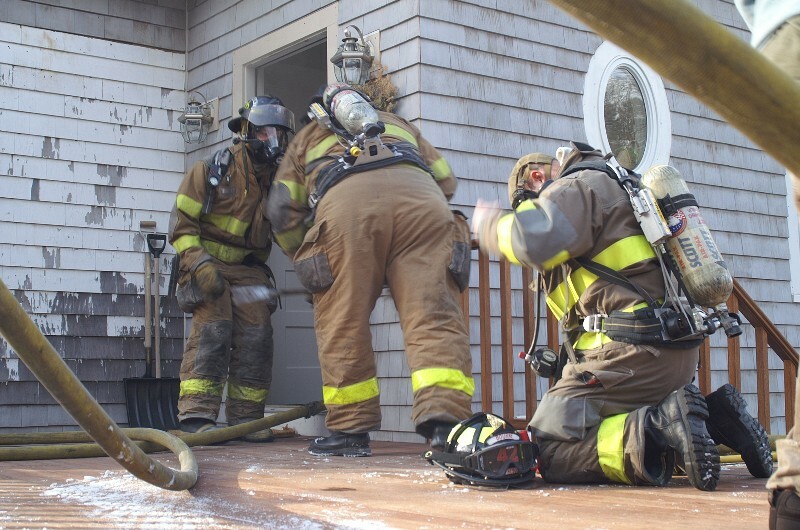 Some are trained in other specialties such as Haz Mat, technical rescue, water rescue / dive team, etc... Each firefighter works a minimum of 42 hours a week consisting of two 24 hour shifts every 8 days. 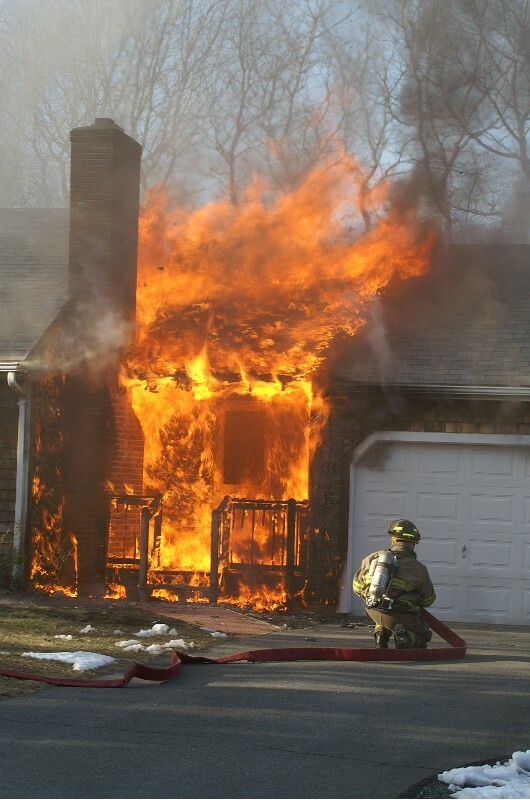 There are (4) groups of firefighters needed to cover 24 hours a day every day. 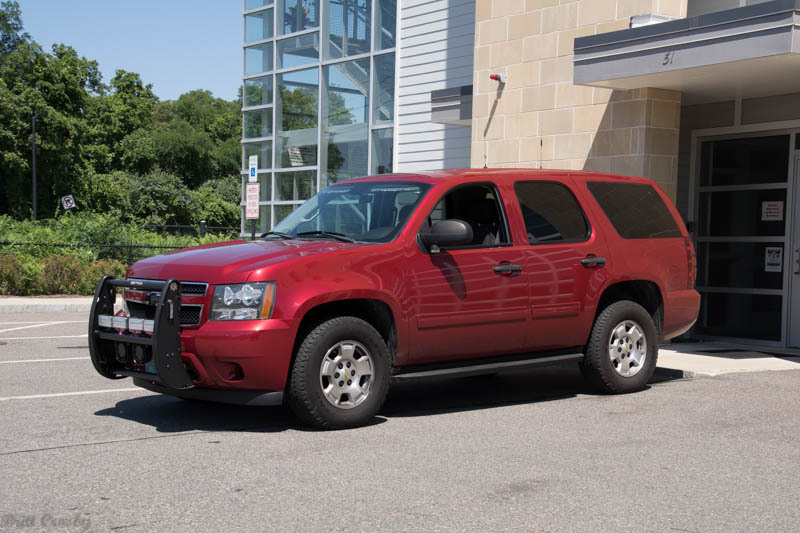 Bourne, because it is split by the Cape Cod Canal, is a difficult town to protect on a good day, with long response times to sections of town in Sagamore and the southern Pocasset and Cataumet areas of town. Traffic conditions around the Canal add to the long response times, particularly this time of year, when the population in town is at its peek. at that time. 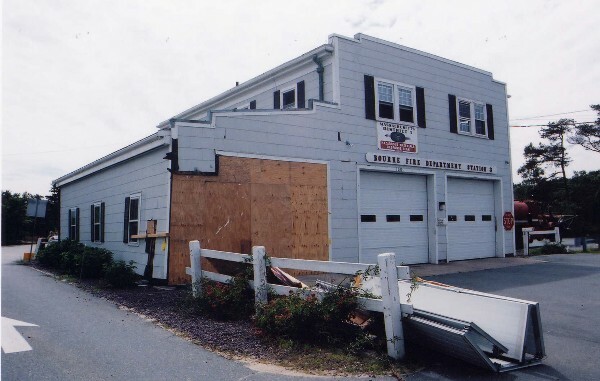 This led to the closing of both Station 3 & 4 and the loss of an ambulance south of the canal in town. 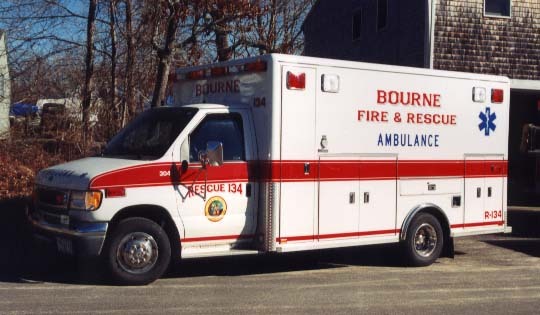 In 1992 Bourne responded to 1753 emergencies (about half what they respond to today) Pocasset re-opened with an ambulance and engine and (2) personnel in 1994. Sagamore re-opened years later with an ambulance and engine and (2) personnel. The location of ambulances in the outer sections of town (Sta 3 & 4) has been of great benefit to the residents in those areas that waited upwards of 20 minutes for an ambulance to come across town before that. Bourne has just barely gotten back to the 36 personnel level they were at 15 years ago, now doing twice the number of runs. The call department that once made up much of the difference in the previous hard times has shrunk to about a dozen members. 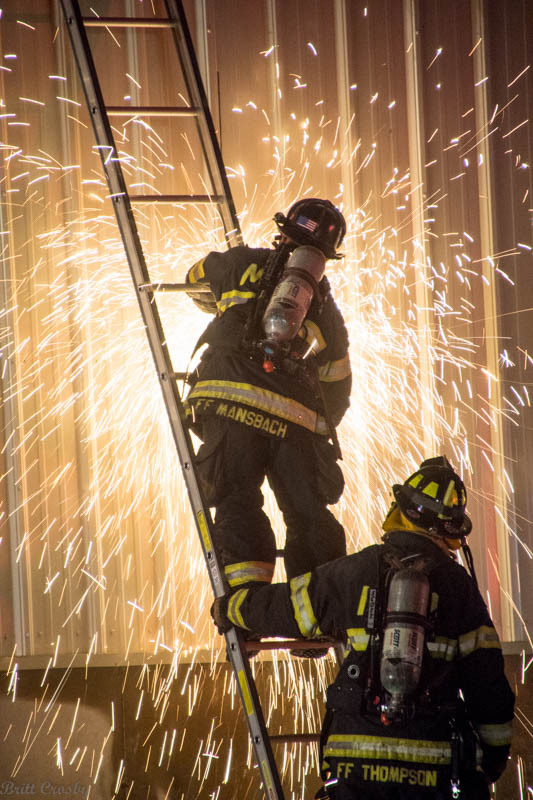 If the override vote fails in October, an estimated 14 Firefighter/Paramedics would be lost. 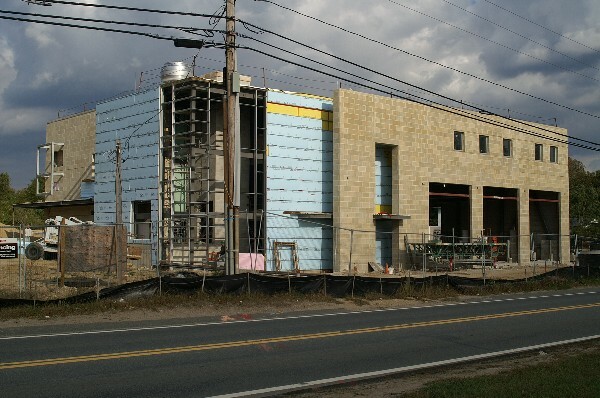 This would reduce the on duty staffing to about 5 or 6 personnel operating from a single fire station in Buzzards Bay. 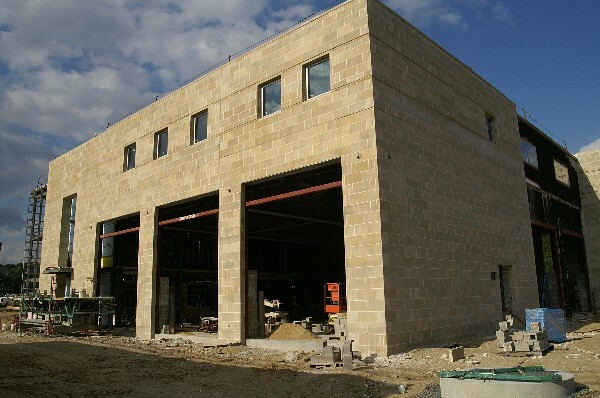 Bourne would close its only staffed station south of the Canal and would not staff the brand new Sagamore station being built by state and federal funding of the Route 3 Flyover project (Bourne can't even pay for its own fire stations). As we all know, calls come in bunches. Two or three at a time usually. Ambulance crews are out of town up to an hour or more and even today, those stations are empty with no fire or ems personnel in them until the crews gets back. 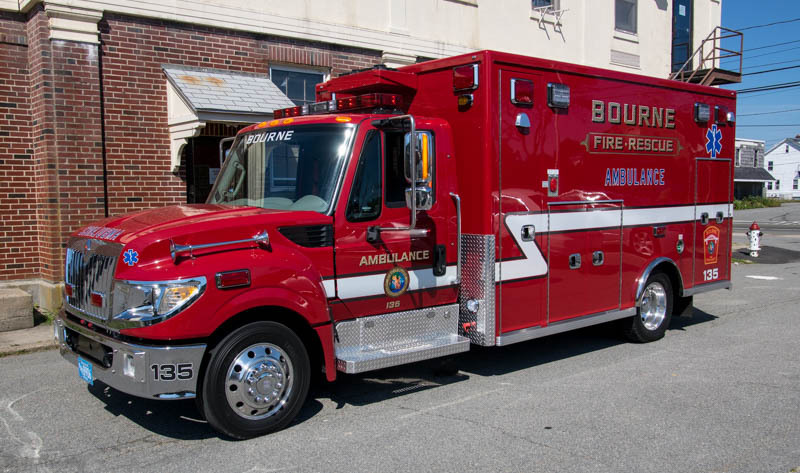 The impact on emergency responses to fires and ems calls in the town of Bourne, as well as the neighboring towns that give and receive mutual aid almost daily already, is hard to comprehend. 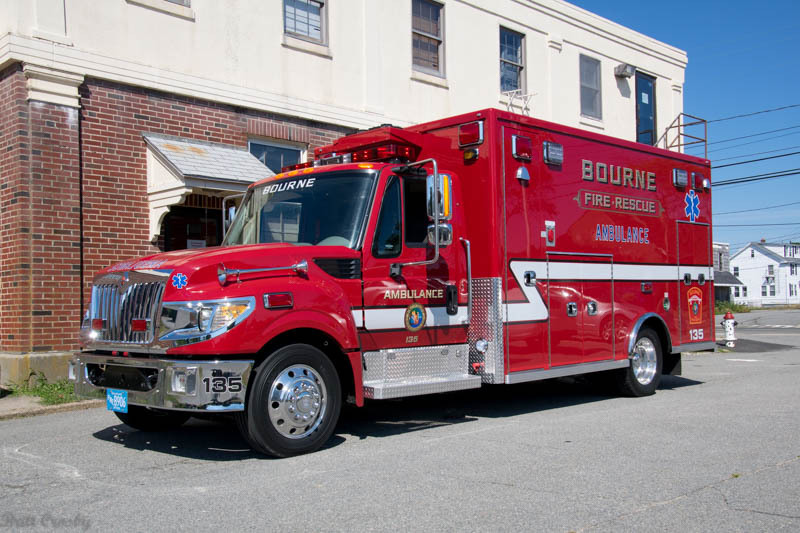 It is safe to say that if Bourne can not find a way to fund its fire and ems department, fire and ems protection in the town of Bourne will be theoretical on paper and less than minimal in real life. If will effect the safety and wellbeing of the personnel and residents of the town considerably to loose 14 of the youngest members of the department, all of whom are paramedics. 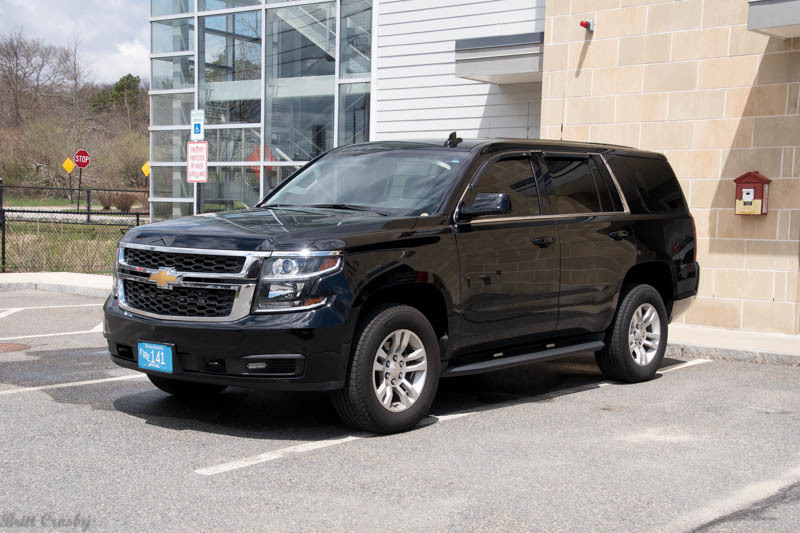 The loss of these personnel, all of whom have been trained and equipped at considerable expense to the town, will have long term effects on the department. 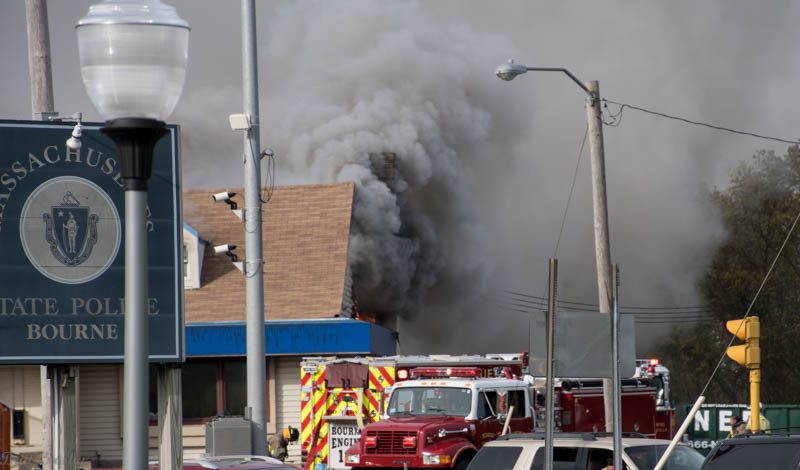 Harwich just went through a similar loss of 6 personnel, including 5 paramedics. Other towns are also facing potential problems. 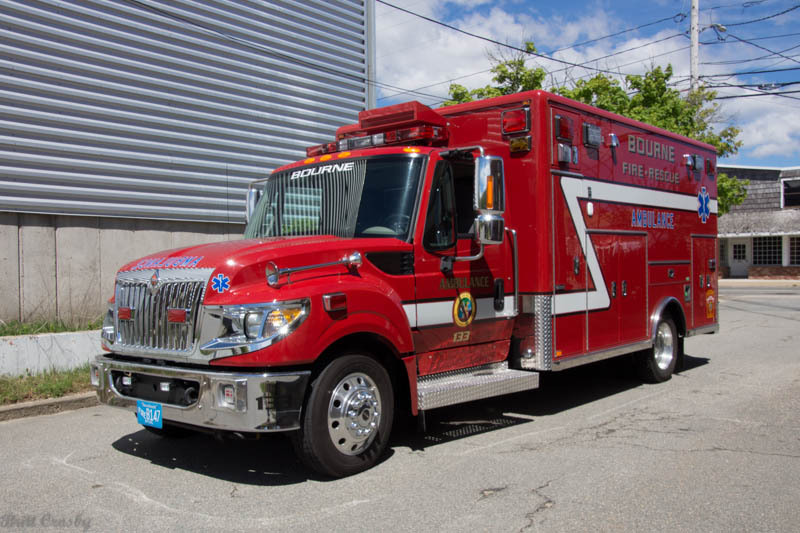 These are extremely difficult times for some departments and while the towns must work within their means, it makes no sense to eliminate the "essential services" that save lives and protect the community. Homeland Security is the current buzzword. 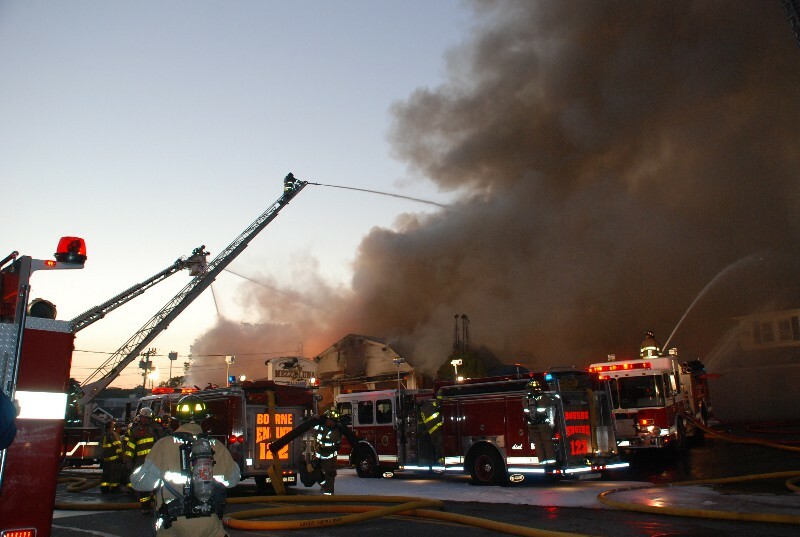 Where is Homeland Security without at least a few firefighters and paramedics in each fire station? Unbelievable!